Due to various considerations I left my previous employ, and am currently looking for suitable alternative workshop premises in London. No easy matter within a budget! Until then, I guess I will have to put my metalsmithing etc activities on hold. 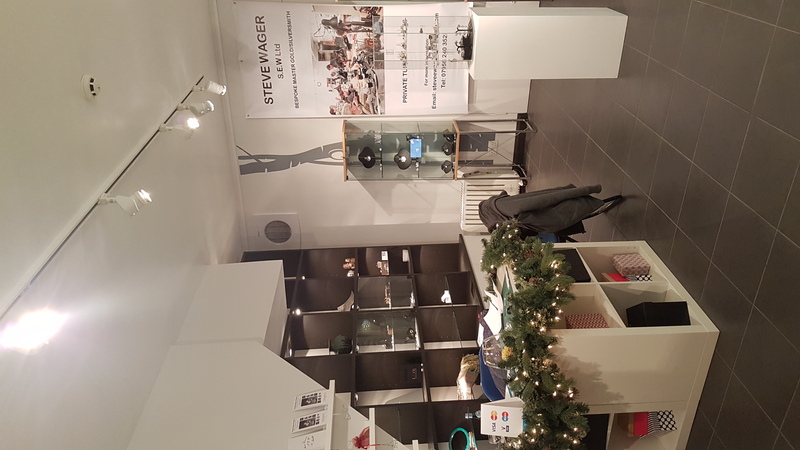 The 6-year lease on Steve Wager's workshop in Hatton Garden came to an end in February, and terms for renewing the lease proved (very) unrealistic. It has unfortunately been impossible to find anywhere else in the vicinity, so this is the end of a 6-year era. Although new workshop premises have been acquired in Camberwell, this is too far away from Central London to integrate with my daily work shifts. So, alas, it is likely I will have to put silversmithing, and indeed all metalwork, on hold for an indeterminate period. This is part of a wider trend of the marginalising of craft and artistic businesses, with the possible exception of sales premises. But even the latter are not immune; the Rountree Tryon Gallery is to quit London after nearly 70 years, retaining only its Petworth site. My 8-week ceramic courses at Central YMCA, 112 Great Russell Street (Wednesday and Thursday evenings, 6:30 - 9pm) start Wednesday 11th October. Book by phone on 020 7343 1700. This small vessel was raised from a 150mm disc of 0.6mm thick fine silver sheet. I arranged for alternate bands to be hammer faceted, and filed and polished. 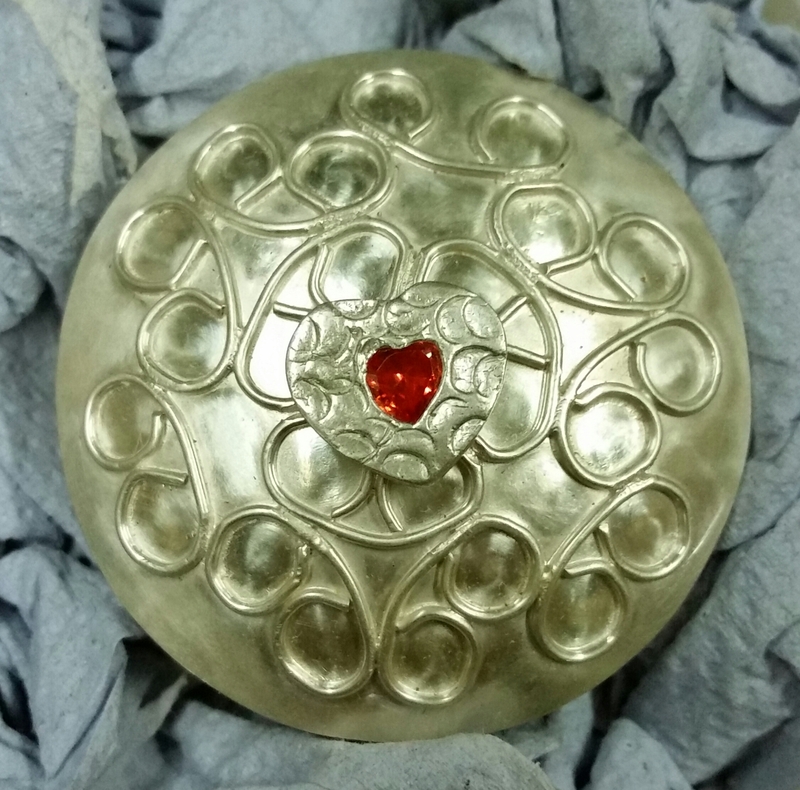 It only awaits hallmarking then shipping! The total weight is only 104gm, but the rim thickness is now 0.92mm. While raising the pot I managed to split it near the base, so I sawed the conical base off and discarded the small cone. I then soldered a flat disc of 0.7mm fine silver to the open base of the pot, and was well pleased with the results. I chose 0.7mm thickness for the new base because I found that I had increased the wall thickness there by the action of raising. And this is it after hallmarking. 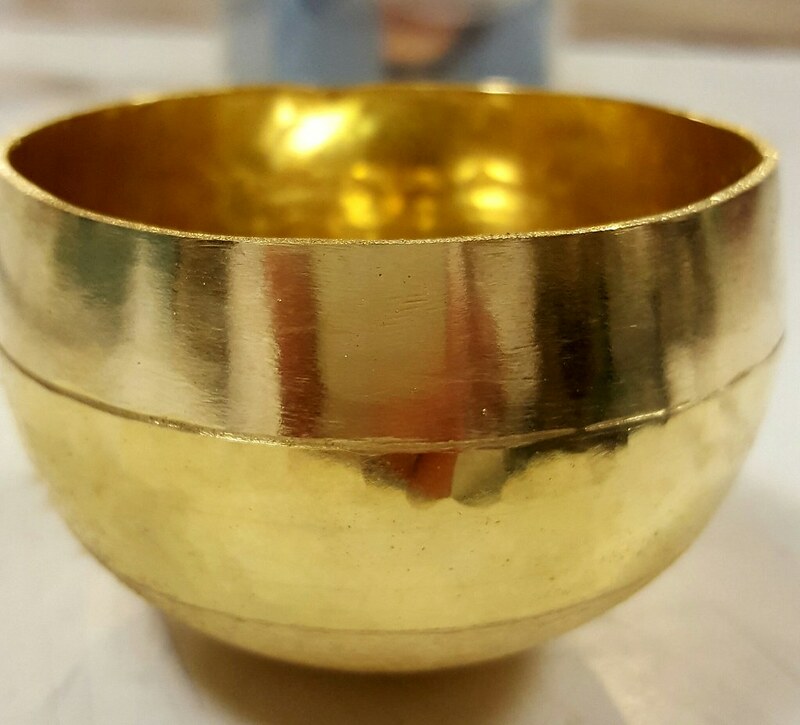 I have made a range of six bronze, silicon bronze and gilding metal pots which are in various stages of progress. 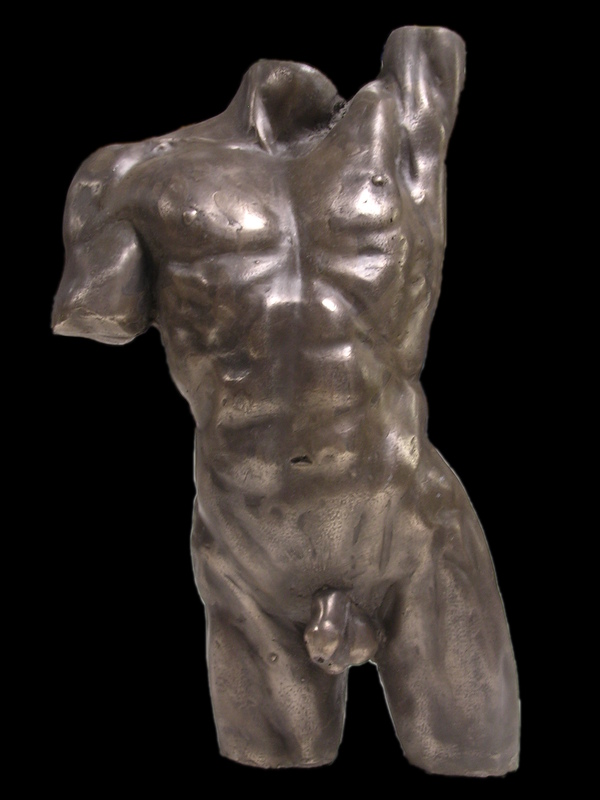 Illustrated is a classical bronze alloy (i.e. 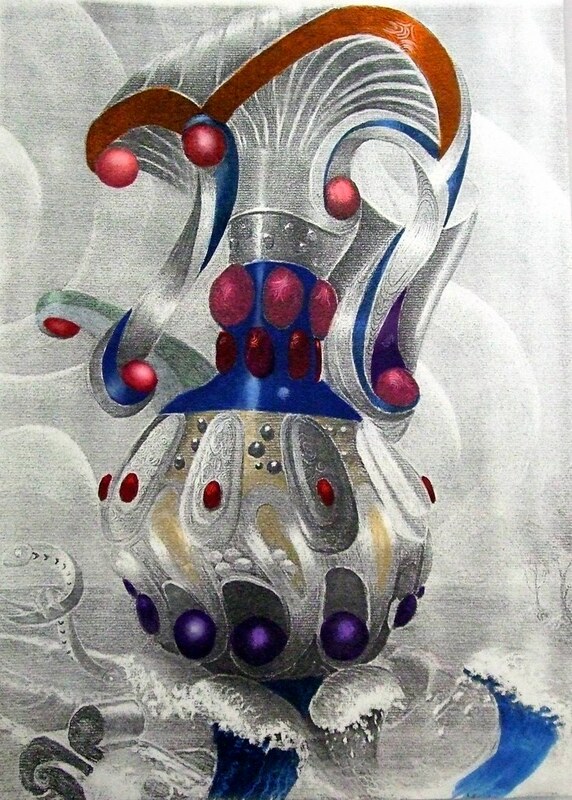 tin bronze) pot or urn which I imagine as a kind of miniature Jean Dunand (Art-Deco) pot. 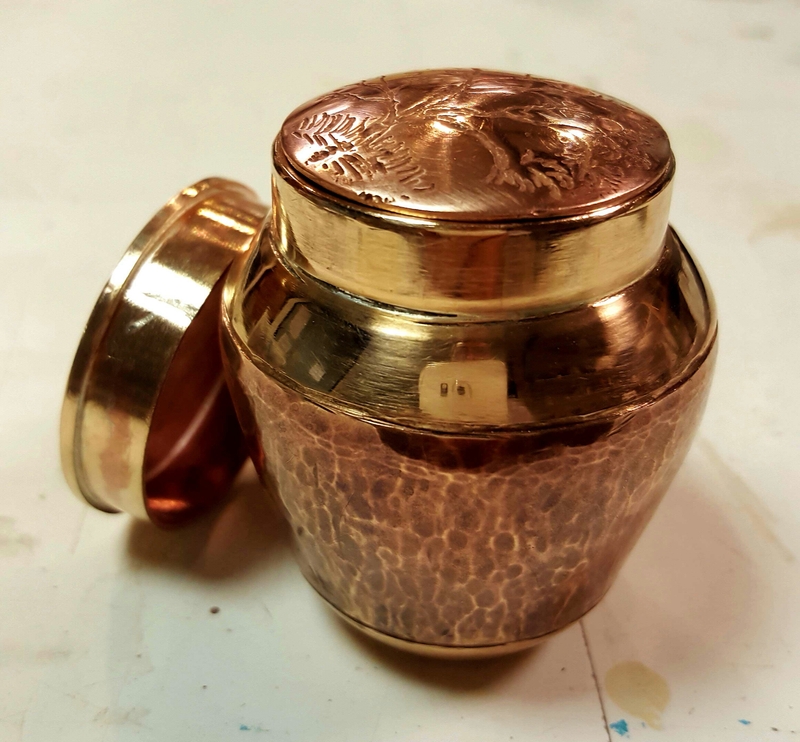 When I say miniature, the pot / urn was raised from a disc of bronze 148mm in diameter and 0.9mm thick. The rim thickness would comfortably be at least 1.5mm now, since the periphery of the disc by the nature of raising is 'closed in', compressing the metal, which thereby makes for a greater thickness. 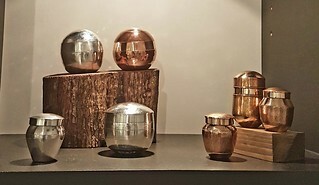 I displayed the three hallmarked sterling silver pots, and four bronze pots, at the SDC Xmas Show at Rivington Street in London at the end of November / beginning of December. Sales generally were good, totalling about £5000 for the group of us displaying. 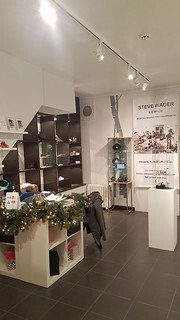 The left-hand picture shows a corner of the ground floor part of the gallery behind the main service desk, the right-hand picture my pots arranged on one of the shelves. 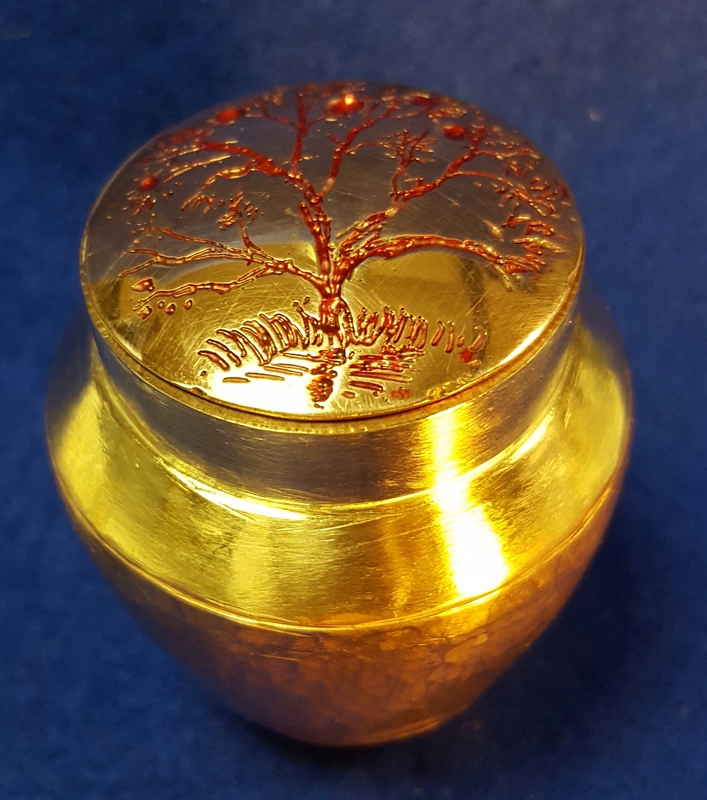 This is probably the most beautiful single container I have made, but unfortunately I just couldn't get the camera to show this. 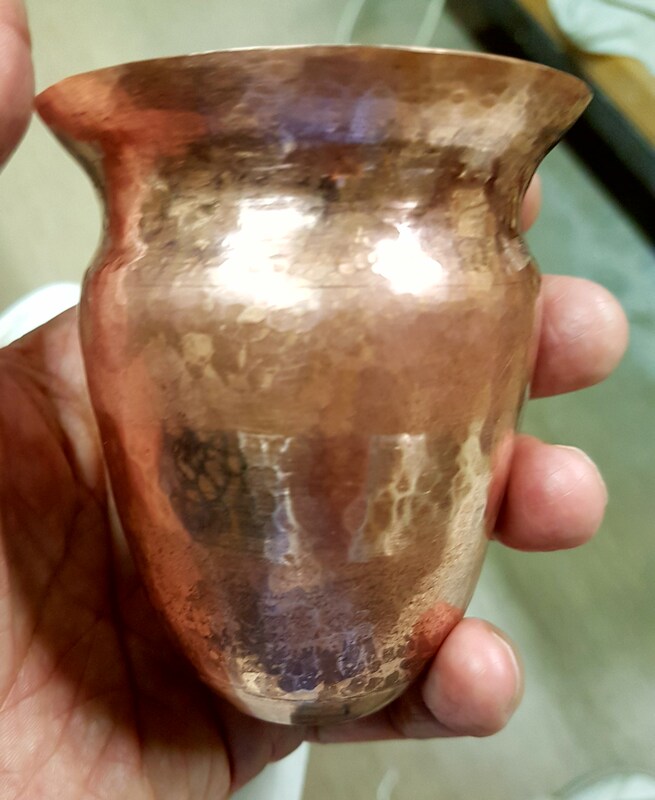 It started off as a plain straight-sided beaker, about 18swg; I got bored with it and left it for some years, then decided to chamfer, planish then polish above the base with a hammer, and planish and polish a band round the top. The centre section was left with the raising hammer marks. 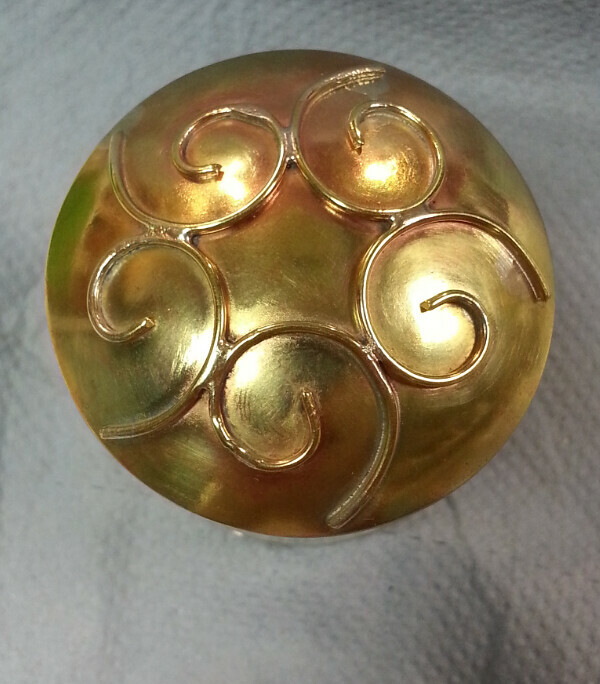 I now like it so much I am in process of making two more; one in gilding metal, and another in silicon bronze. 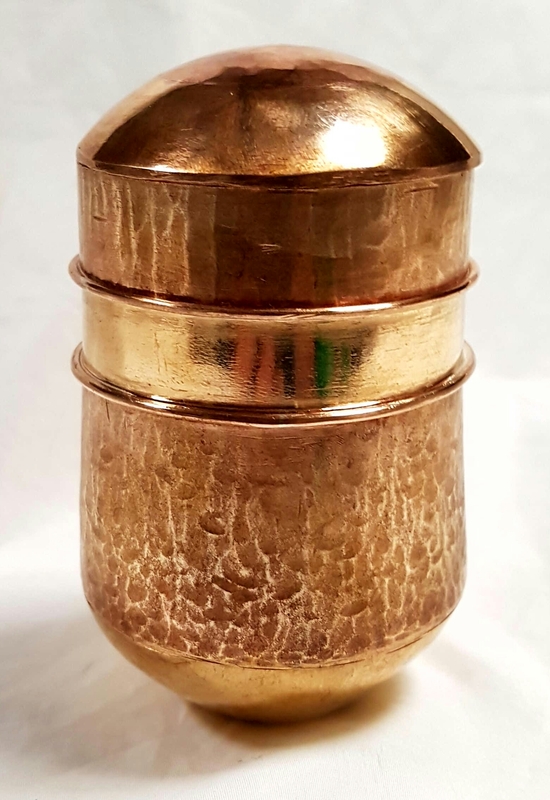 I must have got bored with the tumbling thing after making four tumblers in different alloys, so I decided to make a lid for the first brass tumbler. This showed pretty quickly that it was unstable, so I dimpled the base. 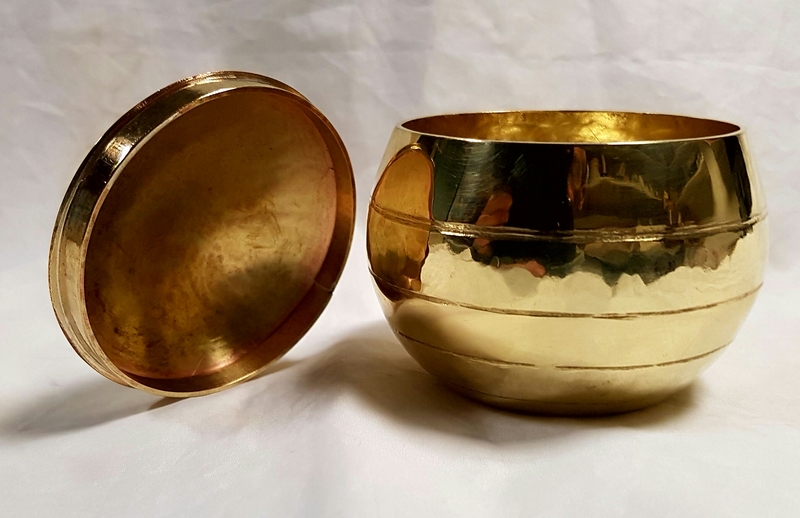 After that I decided that I preferred the tumblers to be converted to pots with lids, so have two brass (only one shown), one gilding metal, one bronze and two sterling pots (again, only one shown). 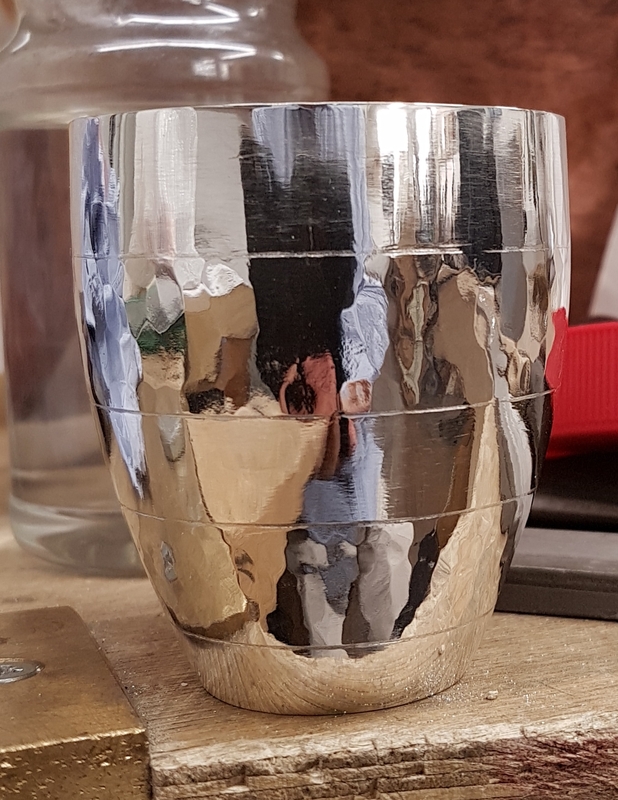 The not-shown sterling pot is still 'work under construction' and does not have a dimpled base; instead I flattened the base with a planishing hammer, then gave it a bevel all round the bottom edge. Pics later. It's been a while since I posted since I have had little time and energy to update the blog. I have in fact made five tumblers; small metal cups which, although they wobble somewhat, will right themselves even when pushed to the horizontal then released. 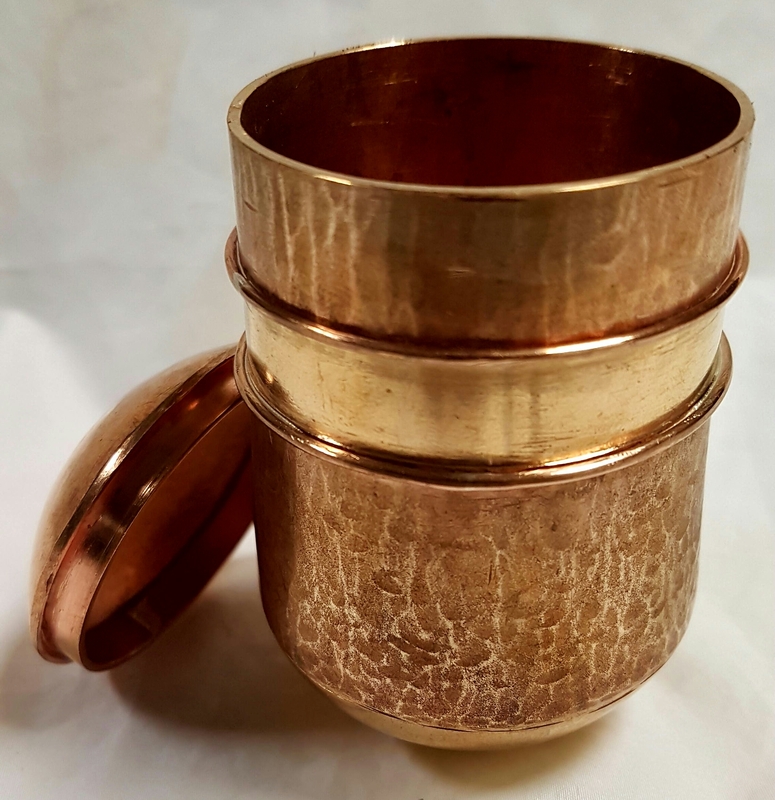 I read somewhere that it was an 18th Century Naval tradition to use silver tumblers for the officers, because the motion of the ship was less disturbing for a tray of tumblers full of whiskey! All the tumblers were made from a 120mm diameter disk of 18swg metal, using either gilding metal & bronze respectively as in the pic top left; sterling silver top right; or brass (bottom two pics). 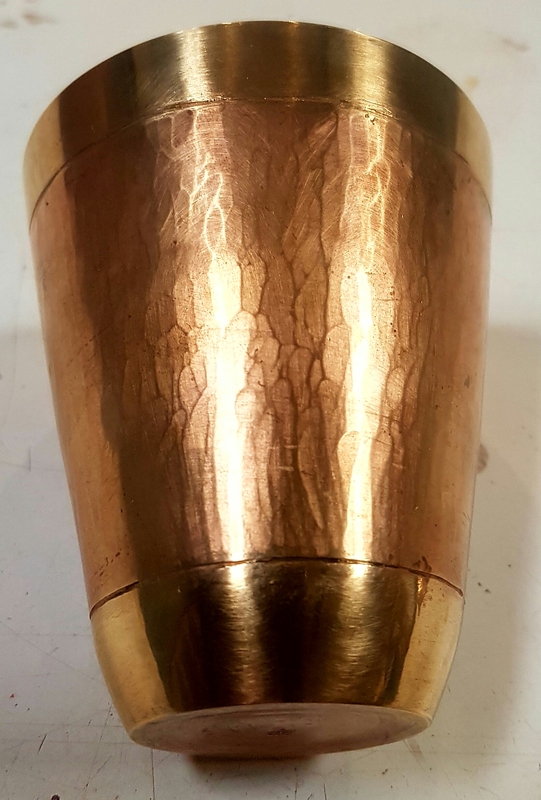 I decided to dimple the base of the brass tumbler as in the right-hand pic. This makes it a lot more stable although it is still a 'tumbler', but reduces the height and internal volume and, as we all know, "size matters". 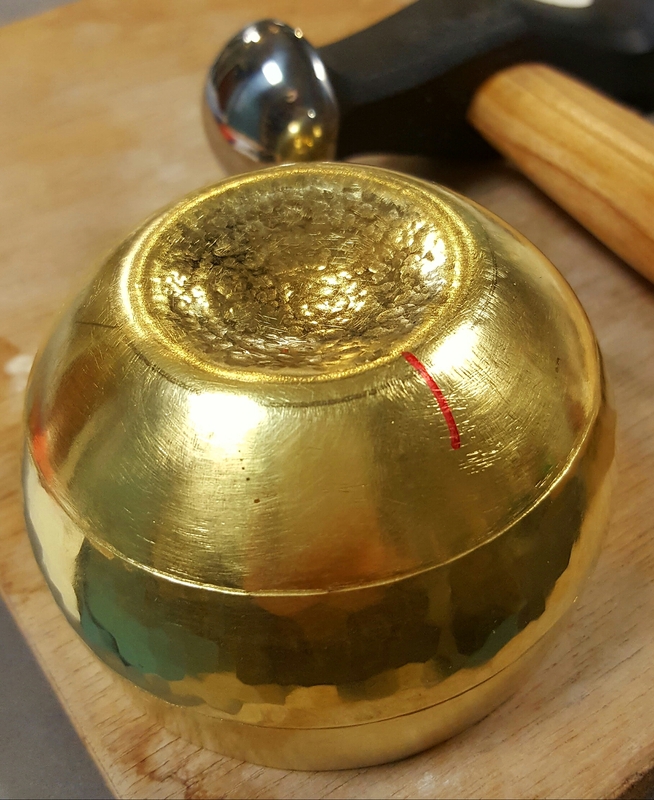 In all cases, I left a centre band hammer-textured. 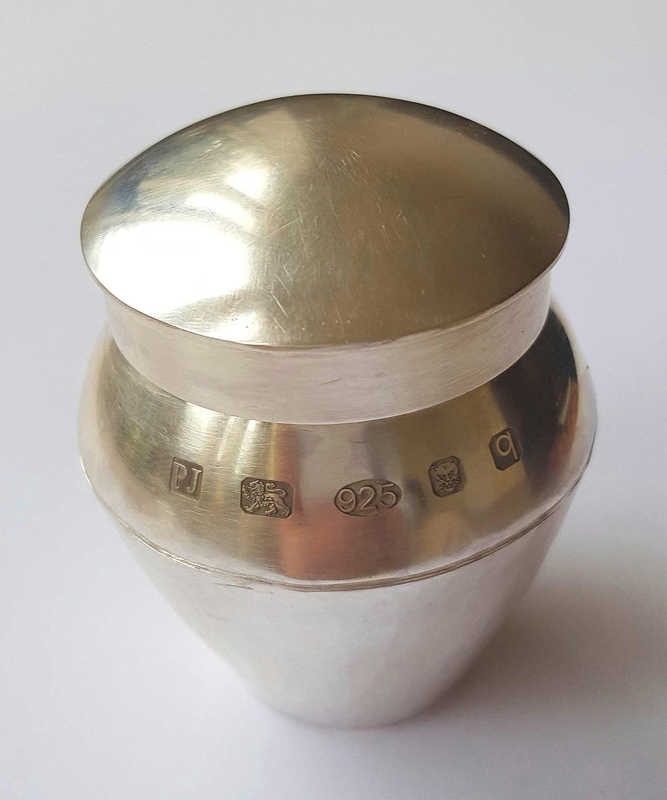 The pictures show the first sterling round pot both with lid fitted and with the lid placed alongside, complete with my hallmarks. 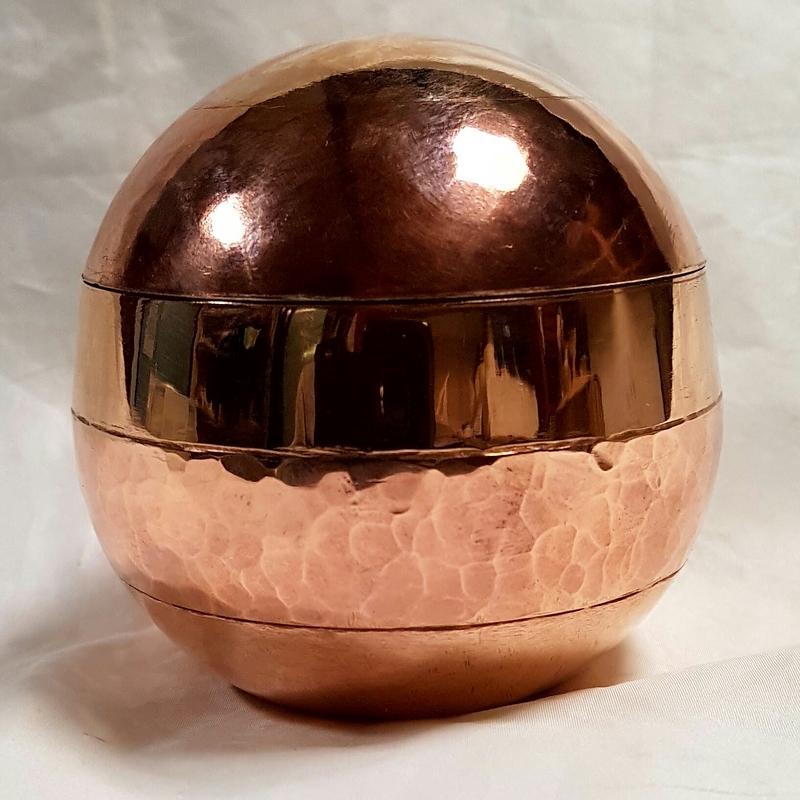 The second pot, not pictured, is finished except for the making and soldering of a sterling dome to fit the collar I have made for the lid. 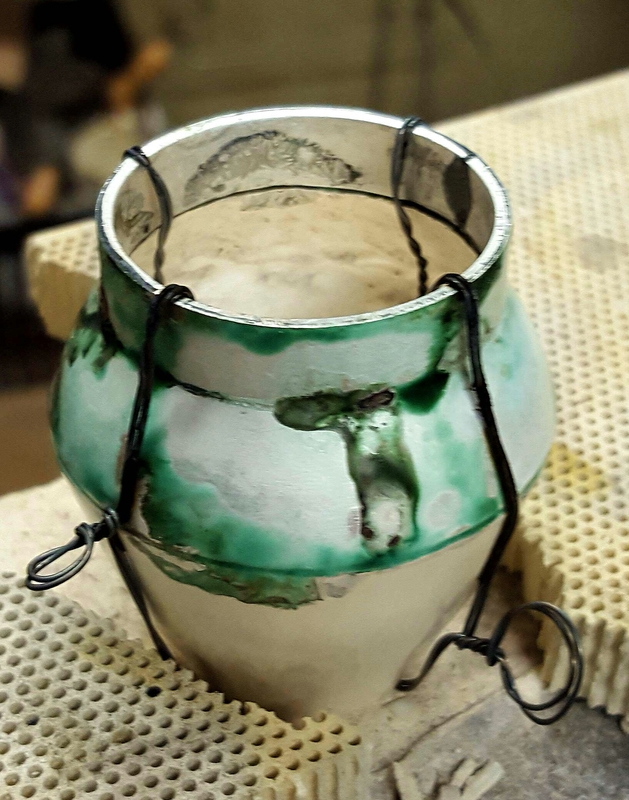 For this second pot, I soldered the neck bezel using only the weight of an old file rather than wiring it up with binding wire as in the previous post - it worked rather better. And I was fortunate to find a cylindrical iron stake that was just the right diameter to allow me to exactly true-up both neck bezel and lid bezel. Unfortunately I now found that the silver (only 1.5mm thick) didn't behave the same way as the bronze, even using the same silversmithing stakes. Basically, I didn't have enough height to provide both a top shoulder and a bottom shoulder, so I decided to do without the latter. 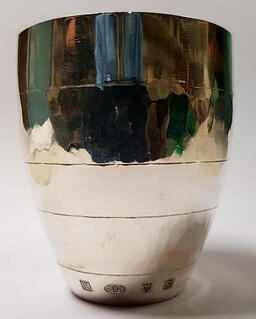 The picture shows the more advanced of the two pots with a silver strip, formed into a band, just after soldering to the base, wired up with iron binding wire, and coloured variously green with flux. 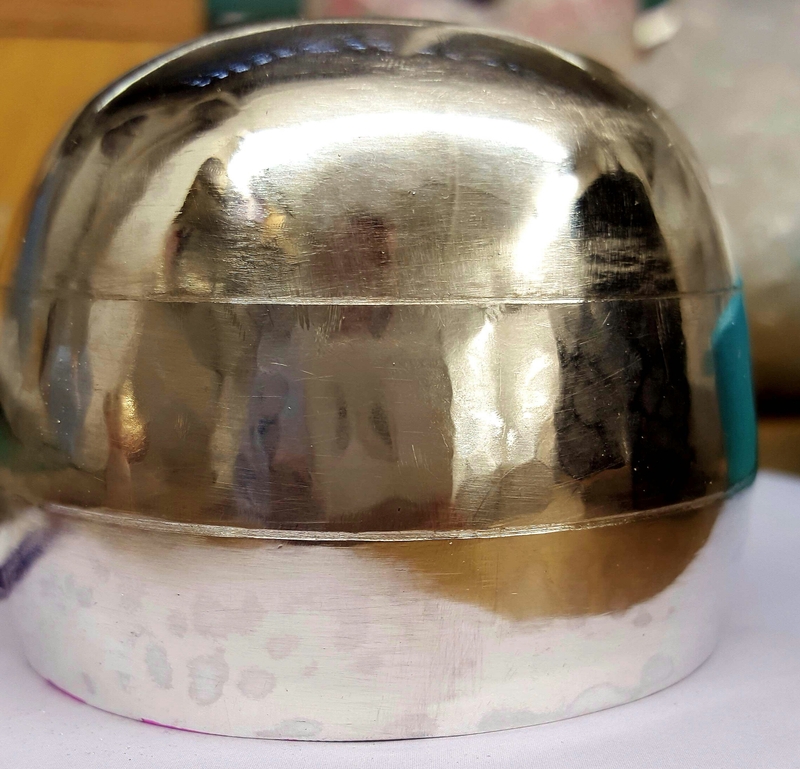 The second picture shows the pot after pickling and before filing to remove all trace of errant solder, along with a second sterling silver band destined to be the bezel for the lid. 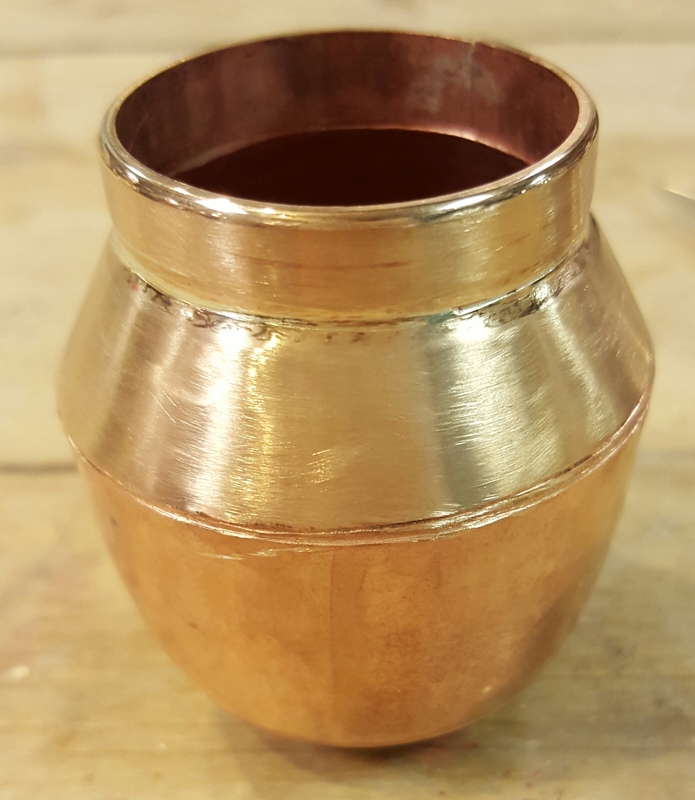 The first picture shows the second bronze pot with an added band of 16swg bronze to make a neck, just after soldering. The binding wires are still in place, along with dark green and blue stains from the flux. The following picture shows the same pot after pickling and a little filing to remove surplus solder. I then made an exterior bezel from a strip of 1.2mm gauge bronze, and soldered a bronze domed lid (made from 16swg sheet) to it. The lid was decorated with planishing marks, which I intensified with the doming end of a large ball hammer. Presently, waiting on inspiration, I have retained the inner lid; the pictures show it without and with the second (outer) lid fitted. The inner lid is slightly loose, the outer one slightly tight. I won't change this behaviour until I've decided what it's supposed to be! 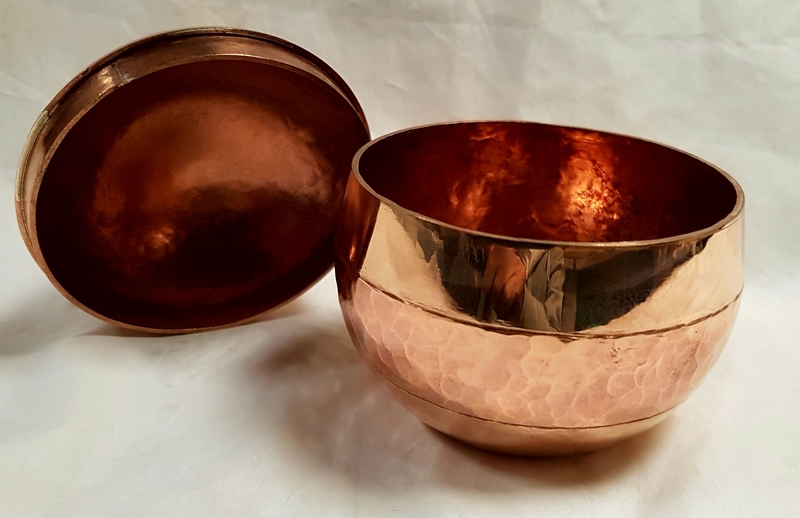 I so liked the bronze 'acorn' pots made in an earlier post that I decided to try them or something like them in sterling silver, so I bought a sheet of 86x172x1.5mm sterling for just under £150, and sawed out two circles each of 42mm radius. 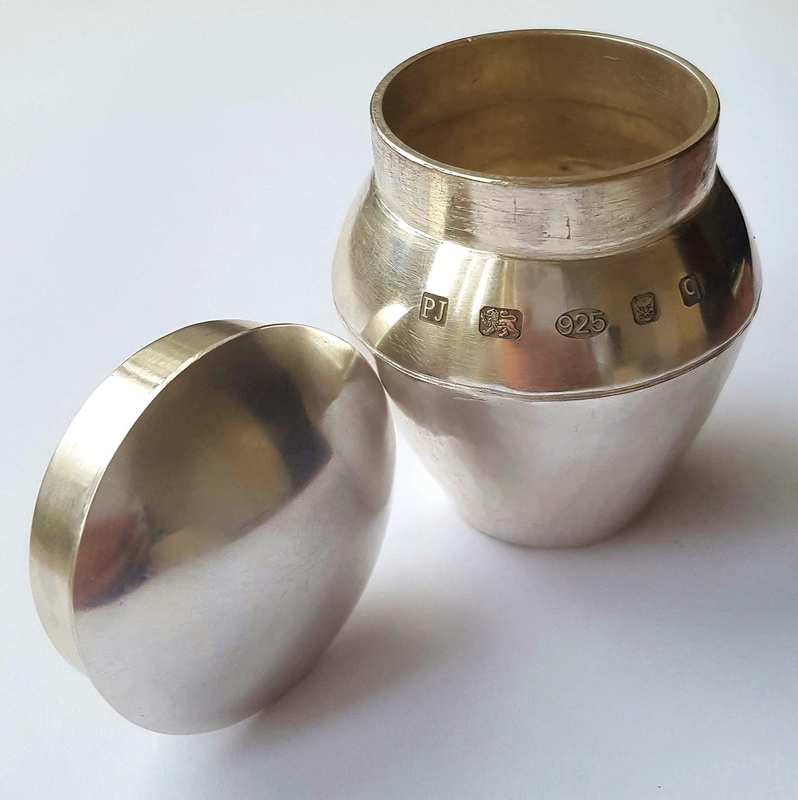 After the usual initial sinking with a doming hammer using a wooden block with a crude saucer-shaped depression, then swapping to a raising stake and a raising hammer, I got a respectable-looking egg-shaped pair of silver bowls. I flattened the bases so they would stand, then planished them at least half a dozen times, with annealing in between, to get them to the state in the photo. I retained the hammered finish by using a light burnish of the surface while I considered what to do next. 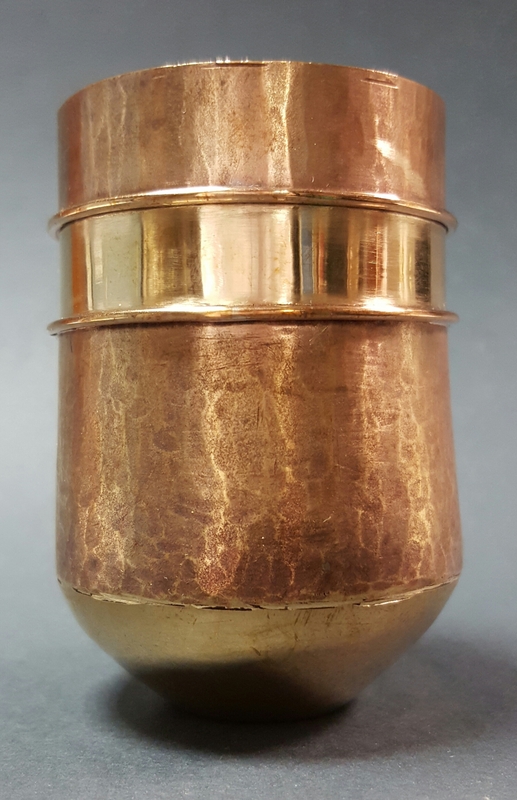 I raised two small (50mm high) pots from 1.6mm bronze sheet, flattened the base of each on a cylindrical stake, then incurved the top quite sharply on a narrow iron stake. I had originally intended them to have domed lids with stalks in the manner of a large acorn. 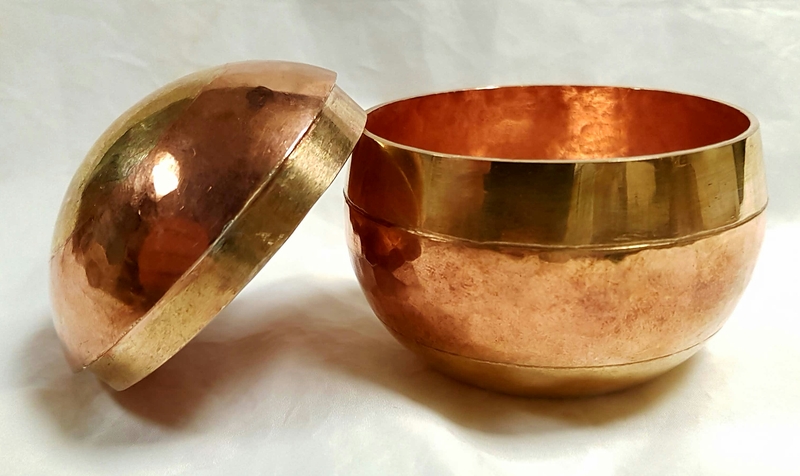 But subsequently I found that I preferred to solder a collar made from a strip of the same bronze around the top to act as a kind of bezel for a lid, which latter I made from a domed and chased disc soldered to a band formed from 1mm bronze strip. 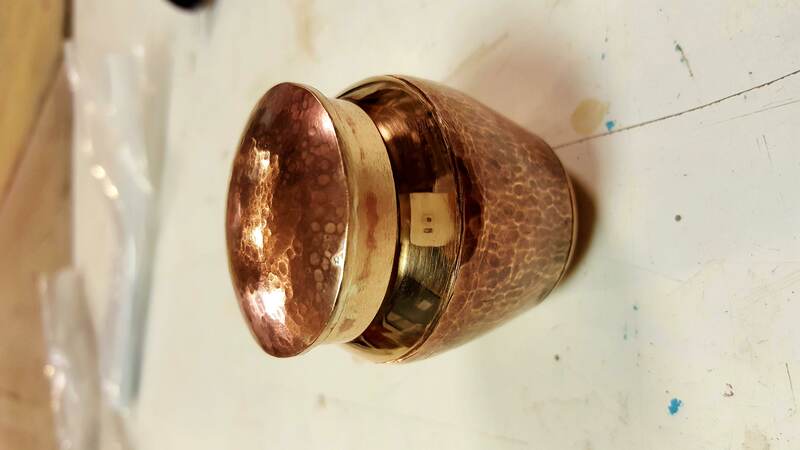 The lower picture shows one of the pots more or less finished with an etched and domed 2p piece (soldered to a bronze band below) as lid. I highlighted the design with red enamel (the resin kind, not vitreous - too unreliable and not red enough in transparent). The goblet was raised from a disc of 1.6mm bronze sheet. The base, originally domed, was flattened so it would stand upright and I hammer finished the rest of the surface. Then I soldered two 1mm round bronze wires round the upper portion. The next step was to saw a light visual separation line round near the base where the tapered cylindrical section gave way to the domed base part, and finally I filed all the patination marks away from the base and from the band within the two wires. These filed areas were then sanded and polished on a buff. After some months, I decided to make a lid, as below left and right. 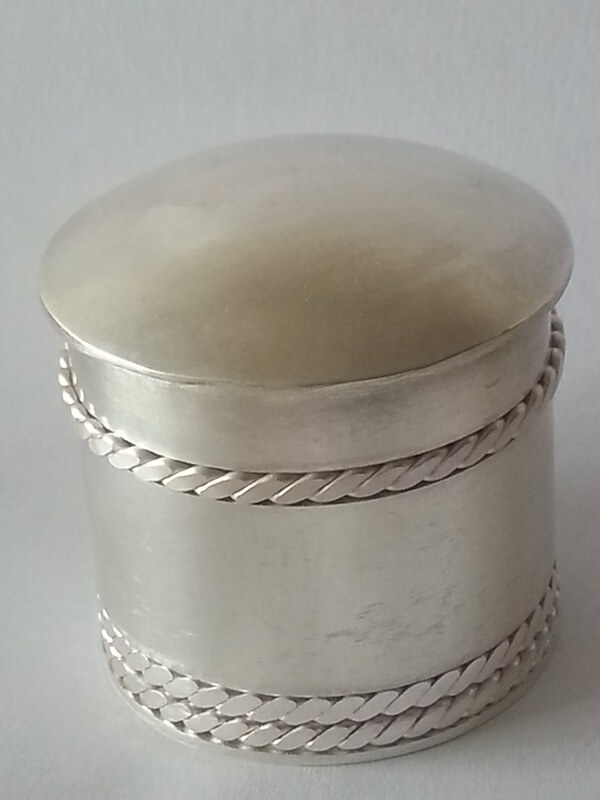 I have now finished the two small heavy hallmarked silver boxes and sent them to their new owners. 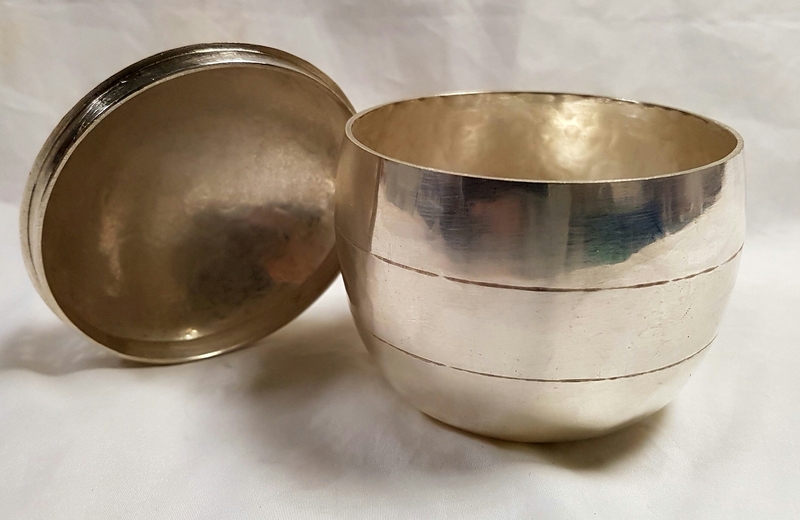 The right-hand box is in fine silver, the left-hand one in Britannia silver; both have domed lids with fine silver filigree wire decoration. 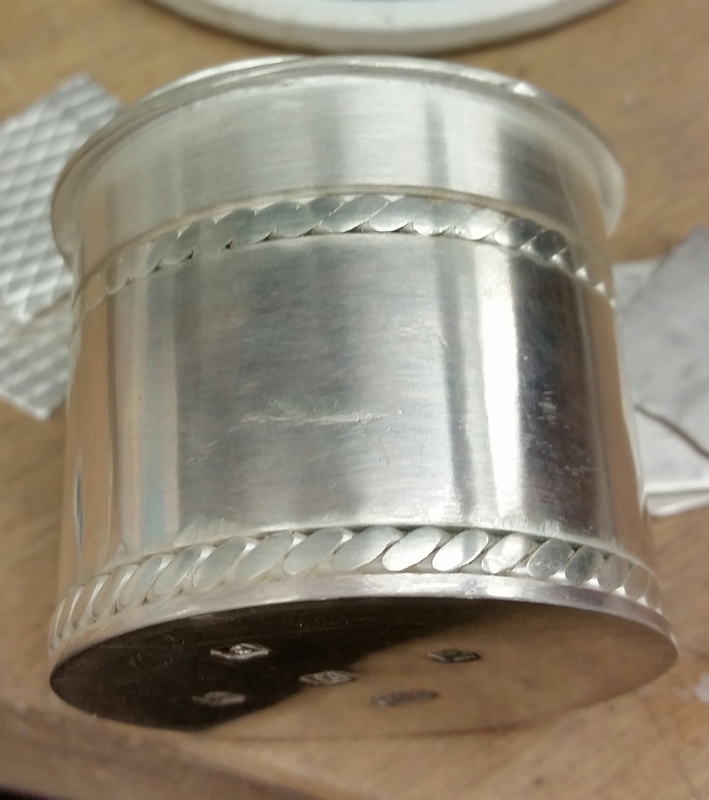 In addition each box has two bands of fine silver filigree wire round the sides as in the pictures below and in an earlier post. I was forced to do without the additional decoration of coloured stones I was contemplating due to shortage of studio time. 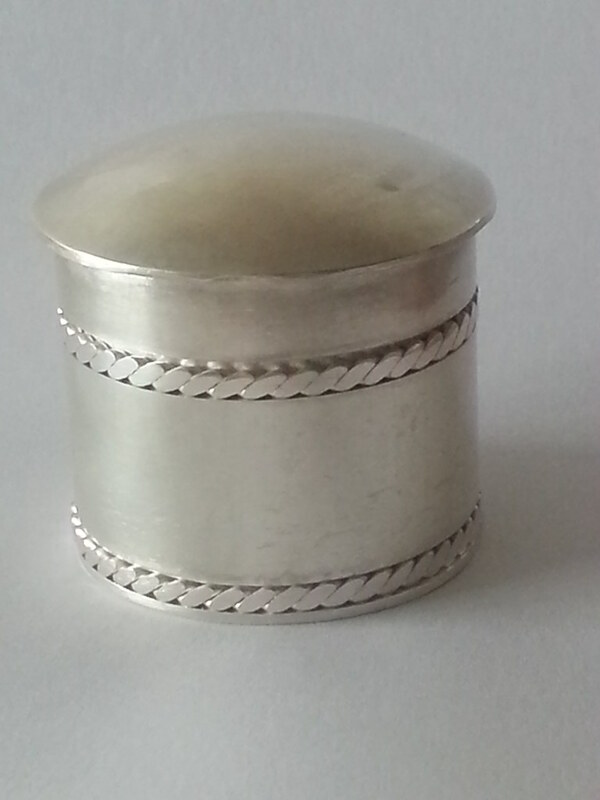 I have nearly finished two small but heavy hallmarked silver boxes. One box is in fine silver, the other in Britannia silver, both have domed lids with fine silver filigree wire decoration. 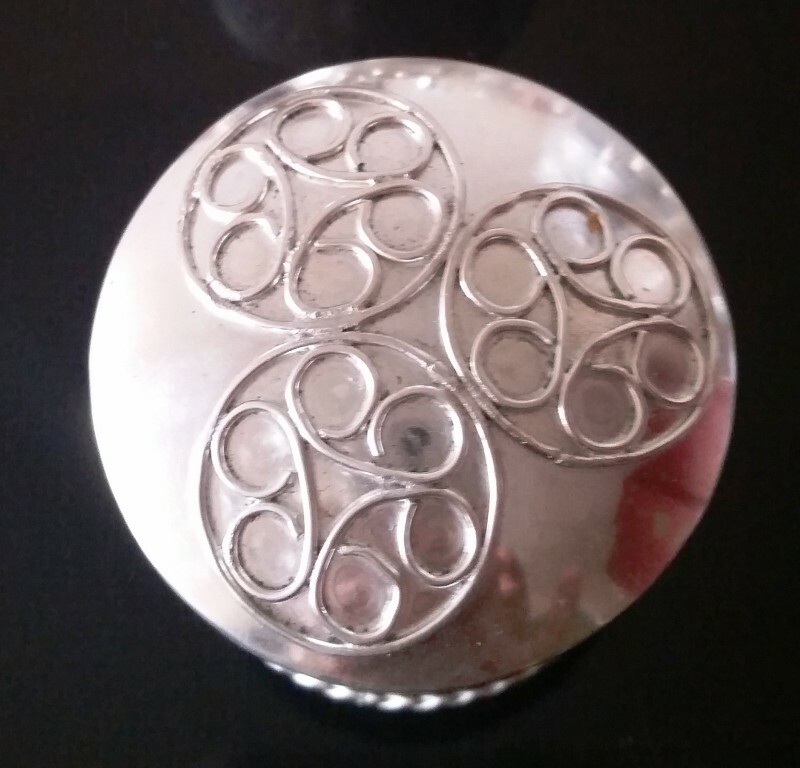 In addition each box has two bands of fine silver filigree wire round the sides as in the picture below. 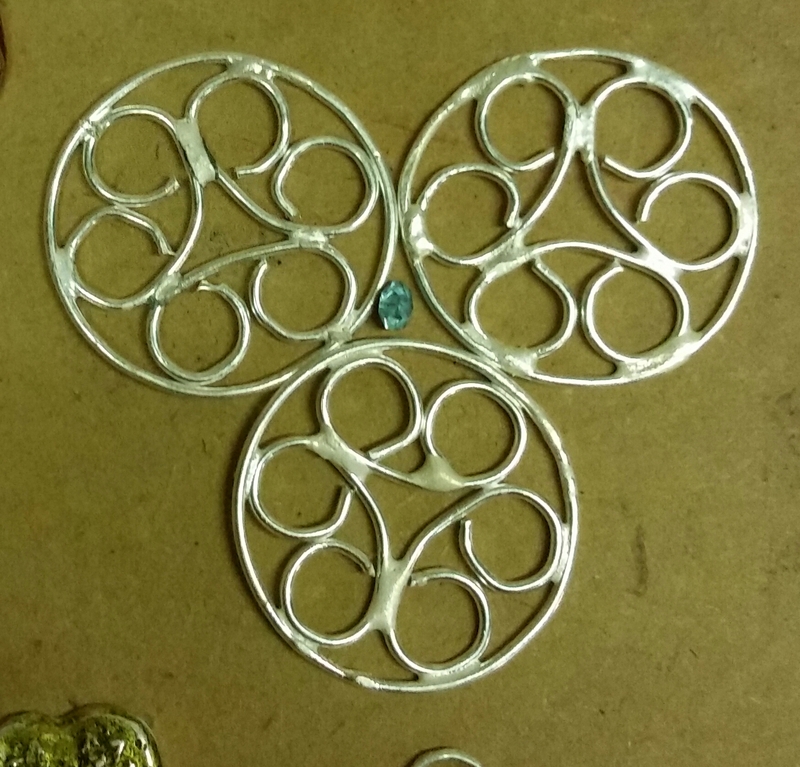 They await final polishing, and addition of colour in some form; either enamel, or stone setting. 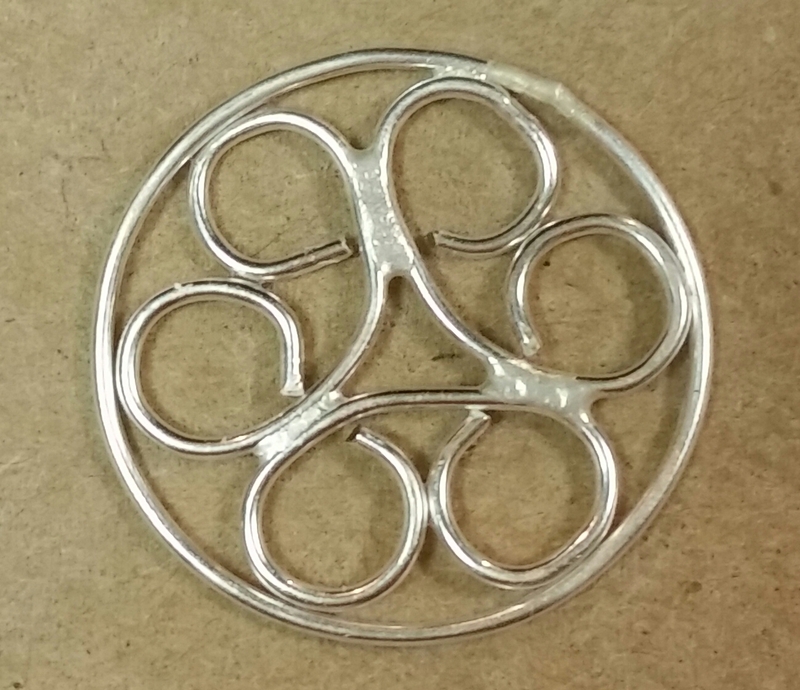 The picture below shows a single filigree unit used for the lid decoration, consisting of 3 'C' shapes in 0.8mm fine silver wire, soldered with hard solder into a circle of the same wire. This is followed by a picture of three of these units soldered together, again using hard solder. 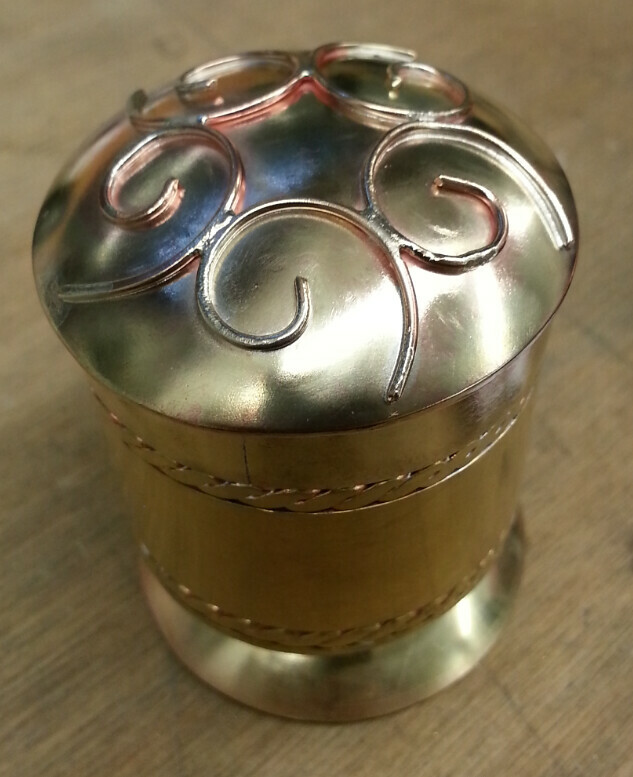 Next follows two pictures of the domed silver tops with the filigree soldered in place using easy solder. 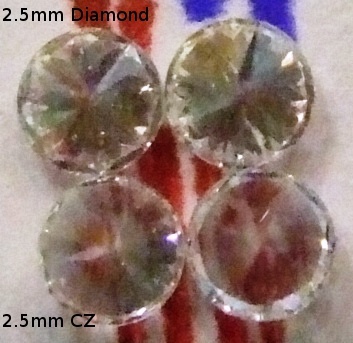 The second one (fine silver) has a red heart-shaped CZ stone in place awaiting setting. 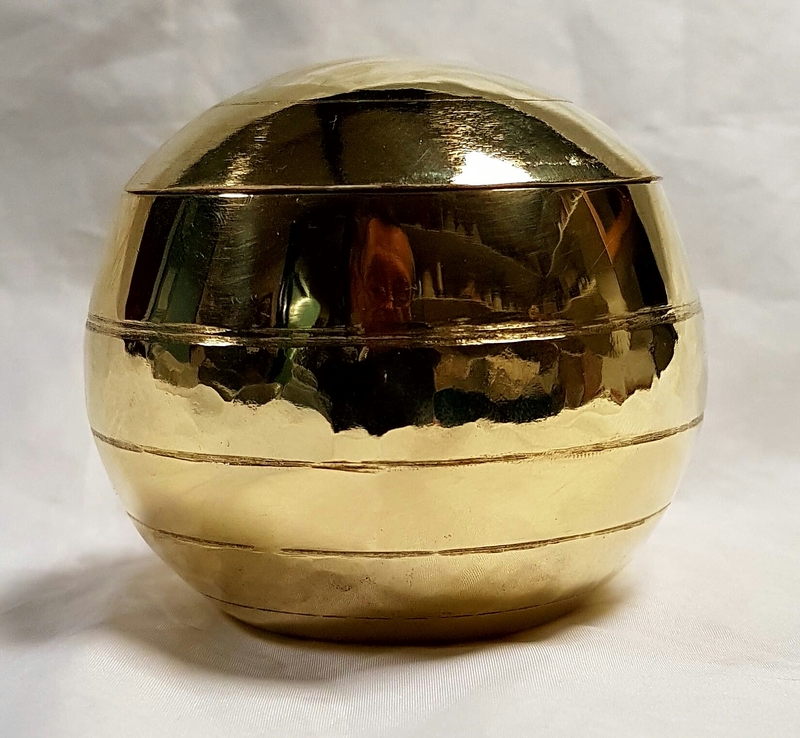 The first picture is a side view of the box, about 40mm diameter, showing the domed top and base, and the two filigree bands round the sides (the colours are my mobile's hilarious attempt at colour balancing, coupled with reflections). 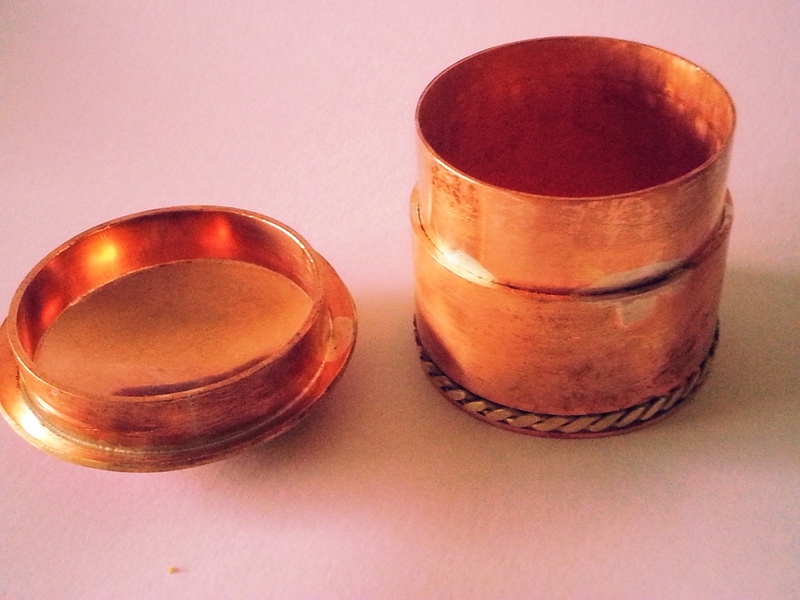 The second picture shows the top view, and the 1.5mm brass wire filigree decoration of spirals. 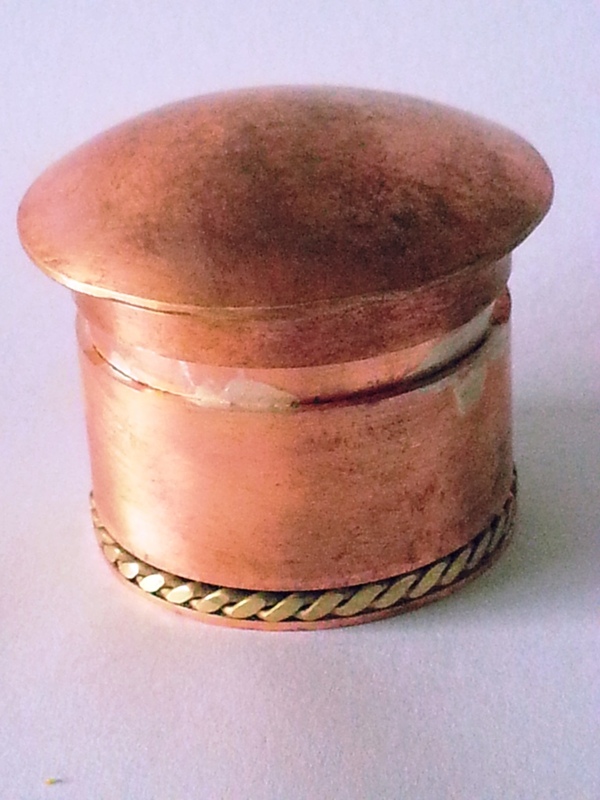 I made the box of brass because I was tired of the rapid tarnishing of gilding metal. Polishing of the top using a conventional mop on a polishing motor was problematic, and I regard it as an unsolved problem for another day. Oh, and the idea the box is waiting on is 'what to do about the domed base?'. I made a domed base on a whim, and now somewhat regret it. In the photo, it is shown resting on the usual inverted saucer with a central hole, which turns it into a sort of lidded goblet. After the variously successful gilding metal versions, I decided to splash out £110 on 1.2mm Britannia silver sheet (for the outer barrel, dome and base) and 0.8mm sheet (for the inner bezel barrel). I had decided on probably two fine silver filigree bands as decoration. However the right-hand picture below shows the effect with an extra filigree band on the base, to exploit the fact that I had additional height in the inner bezel to exploit. But it is quite likely that I will roll some more filigree, in a much wider band, and use that for two bands as in the first picture. The box currently weighs about 140gm, and feels distinctly heavy (too heavy most likely, unless you are Royalty and used to such things). So if I make a future box, I will almost certainly scale the gauge down, or the size of the box up. In any case, there are a couple of unresolved issues; soldering of barrel to bezel without flooding the lower filigree ring, and removal of an unfortunate couple of deep scratches caused by being clumsy with a coarse file. And final sanding and polishing will likely highlight other defects! 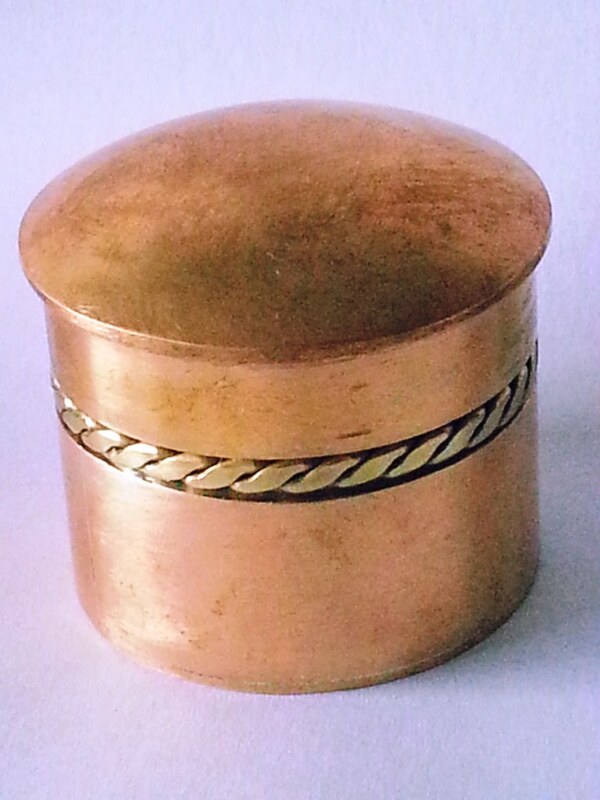 I made a gilding metal round box to remind me of the process, last done some 4 years ago. 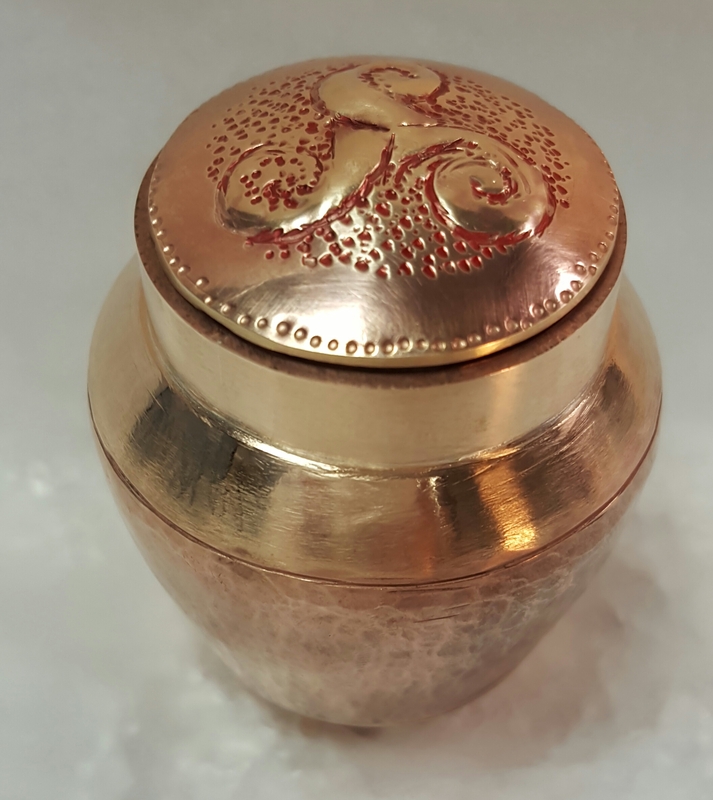 By way of variation I domed the lid, and added a single band of fine silver filigree round the closing line of lid and box. The two pictures on the left are of this box, both with lid in place, and lid separated from box. 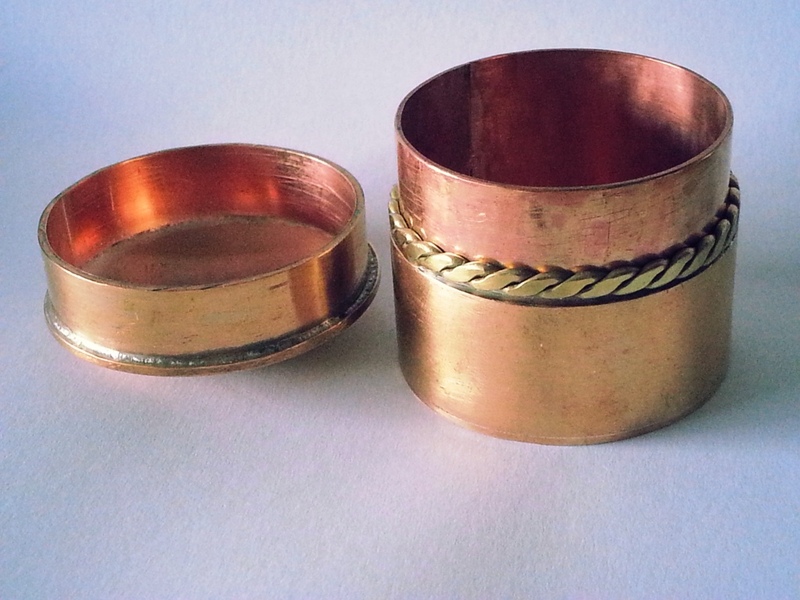 I then made a second box but this time designed to take a filigree band both round the base and round the closing line. To make this possible, I soldered the base of the box to the inner bezel (which runs full-length of the box), the filigree band was threaded onto this, then the barrel of the box followed next. Another band of filigree on the bezel, then the lid part of the barrel closes over the remaining part of the bezel. 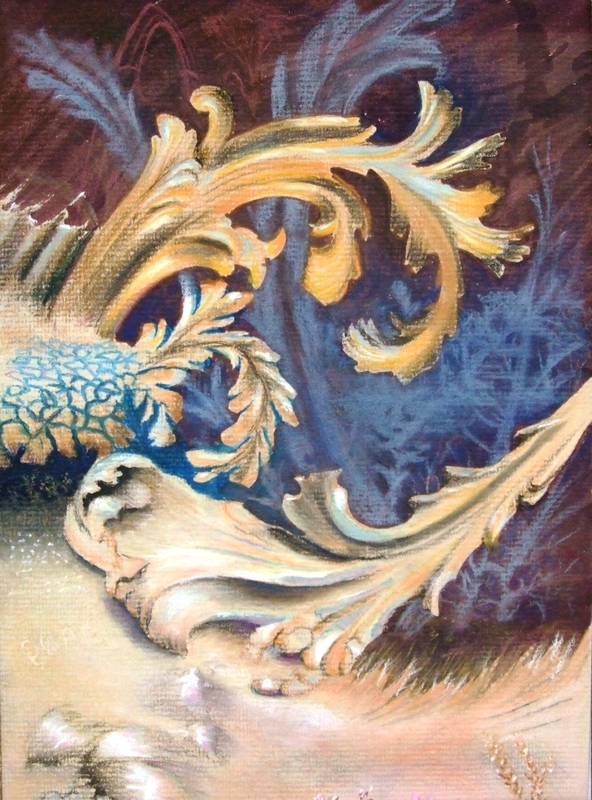 The two right-hand pictures show this box, but without the upper filigree band in place. The box is still awaiting filing to clean away excess silver solder etc. 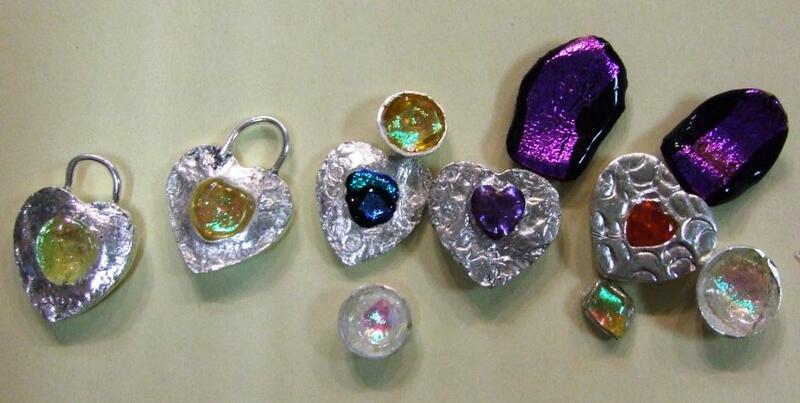 An assortment of PMC hearts with heart-shaped cavities, some with coloured CZ, some with dichroic glass, all fired-in-place. 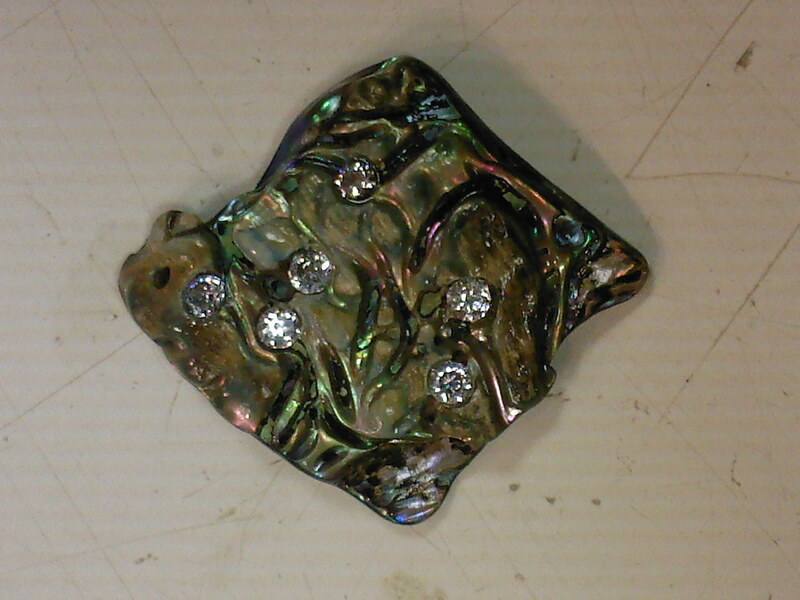 £400/ct diamonds are nice, but 2.5mm CZ looked exactly as nice when set in this Paua shell. 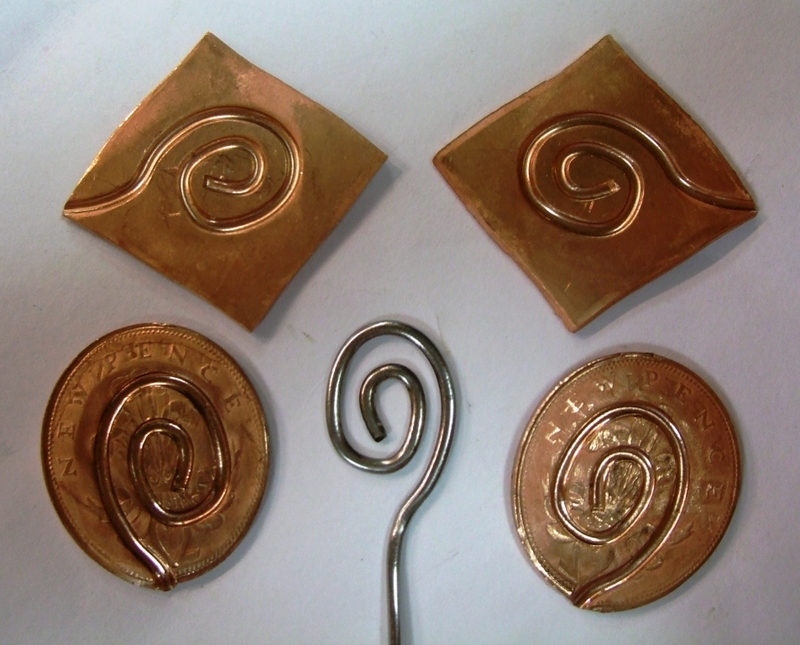 A spiral of 1.5mm steel wire, rolled in a sandwich between two bronze coins, then between two copper sheets. 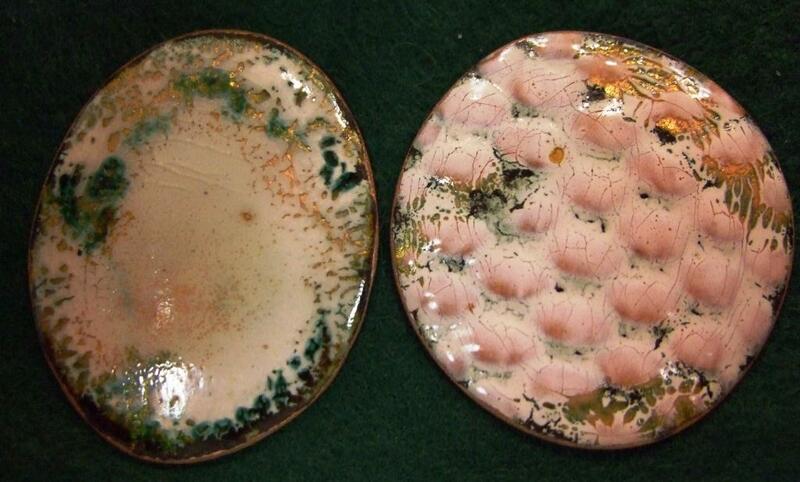 These coin-bronze pendents were enamelled with diamond flux, then overlaid with opaque white before firing again. Another Staff Development course financed by Central YMCA, was an advanced course with Niall Paisley run at Holt's Jewellery School in Hatton Garden. The course was at the end of February in 2007, three full days 9am - 6pm, and covered pave as well as bezel and prong. There is some information on the tutor at http://johnnyrocketltd.com/niall_paisley.php There were only 6 or 7 attendees, and most were in the industry to some extent or other; either employed in jewellery workshops, shops, or in at least one case, starting up a manufacturing company. And one young man had had several years training as a goldsmith, but was currently working as a central heating engineer. However, he hankered for a return to his earlier vocation. One of the highlights for me was that I was unofficially awarded 'course best' setting of a tube-set CZ, although my pave will take a lot more experience. 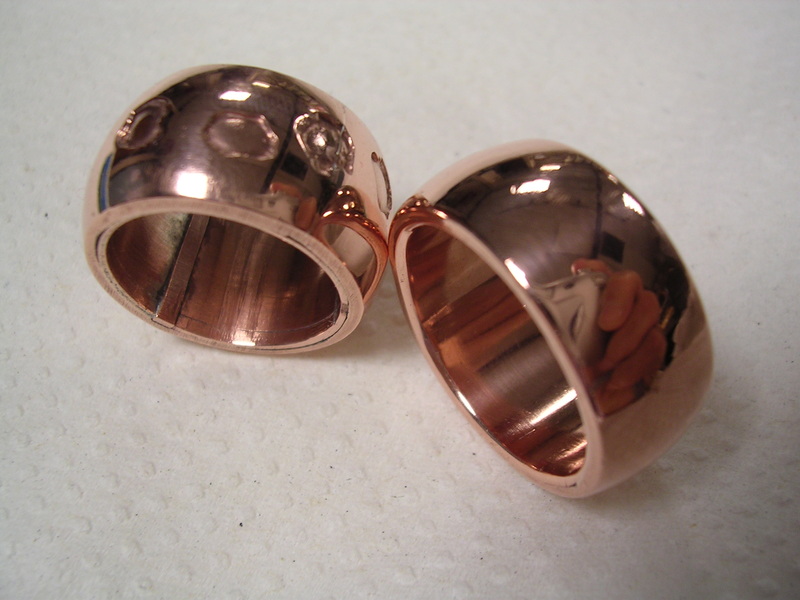 The domed copper rings pictured above were each made in three parts, in the form of an inner plain band and an outer pair of domed half-hoops. 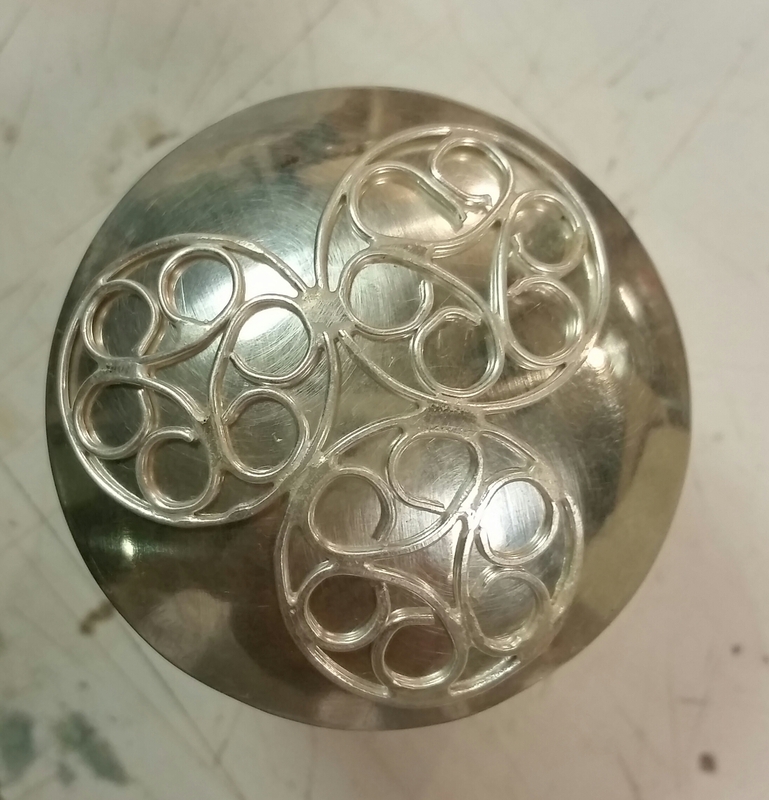 These elements were soldered together and then polished to give the finished result. Usually my sense of purpose is more or less exhausted by the time I get to taking pictures, but I guess you could always say the reflections of my fingers give added interest... The left-hand ring has also had a sort of duck-foot motif etched in a meandering fashion round the outside, maybe I still had egg head on my mind (they were intended for an intellectual friend). This course was financed for me by Central YMCA as part of my Staff Development, and ran in October 2005. It consisted of an intensive one-day course in the lapidary workshop of Holts in Hatton Garden, London and was run by Roger Dunkin. Pieces of hard stone (varieties of quartz etc) were dopped to a stick, then ground and polished with rotating diamond and carbide laps. 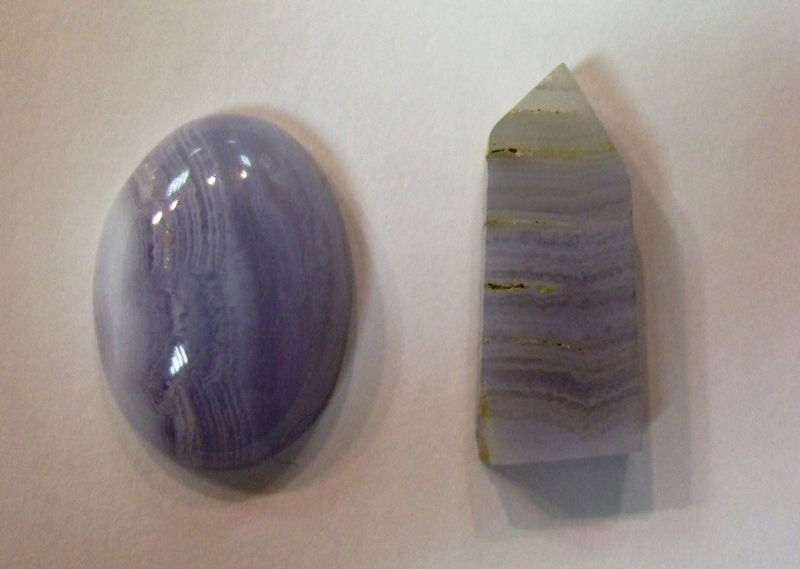 I managed to end up with a big blister from accidentally touching the hot dopping wax, but also took away a nice lacy agate cabochon, together with a small (4cm) carved and polished quartz cross. The workshop was very well equipped, and I will be tempted to sign up to a future facetting workshop. 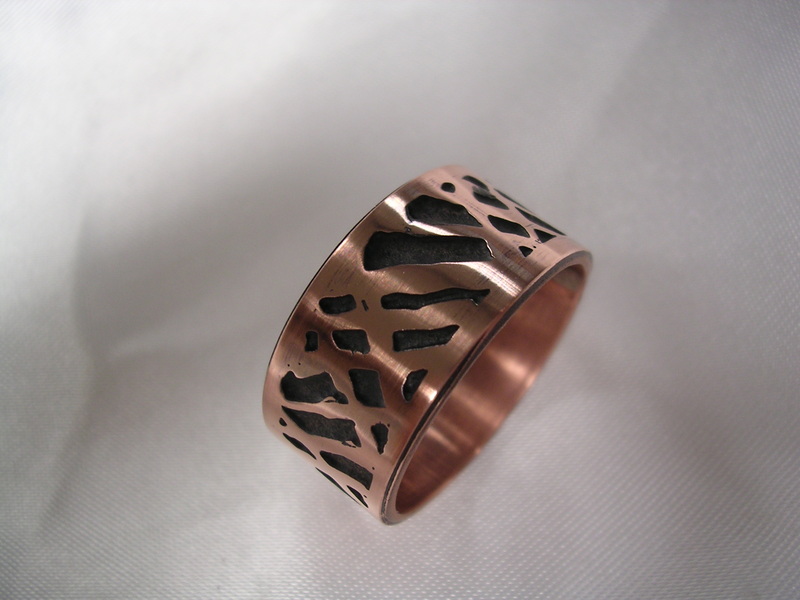 When I first started making and etching copper rings, I was entranced by the attractive patterns I could get. Subsequently however I found that the sharp vertical edges of the etch were very rough on the skin when worn even for limited periods of time, and even after the ring had been tumbled with abrasive for some hours. I found that the raspiness was completely cured by enamelling, using the traditional techniques of melting coloured glass powder into the etched cavities. Unfortunately, since I used opaque enamel, this also robbed it of the original dynamic appeal. 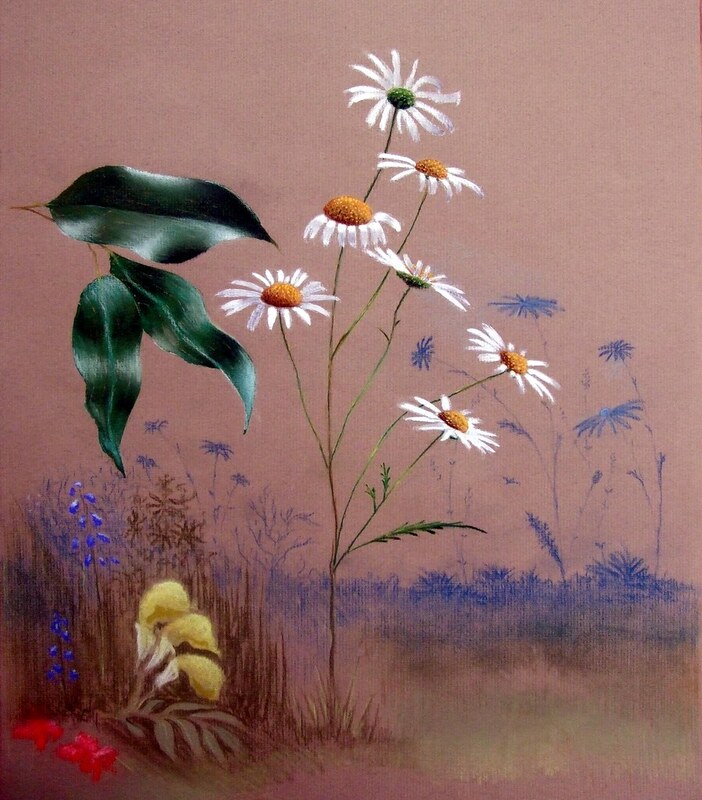 I feel that if I expend enough effort using transparent enamels instead, it will bring back some of the missing life. 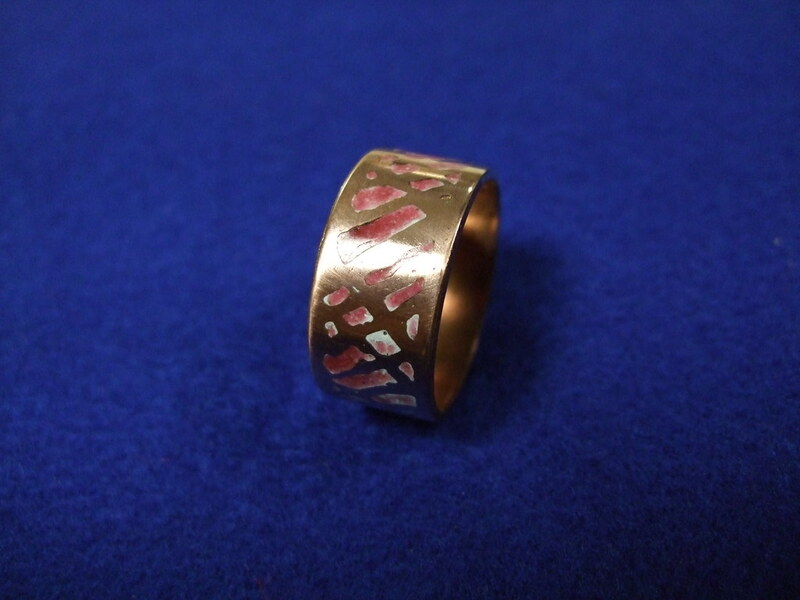 A student ring which was pierced through to give a pattern round the entire band was similarly rough on the skin; this was partly cured by fitting a fine silver liner. 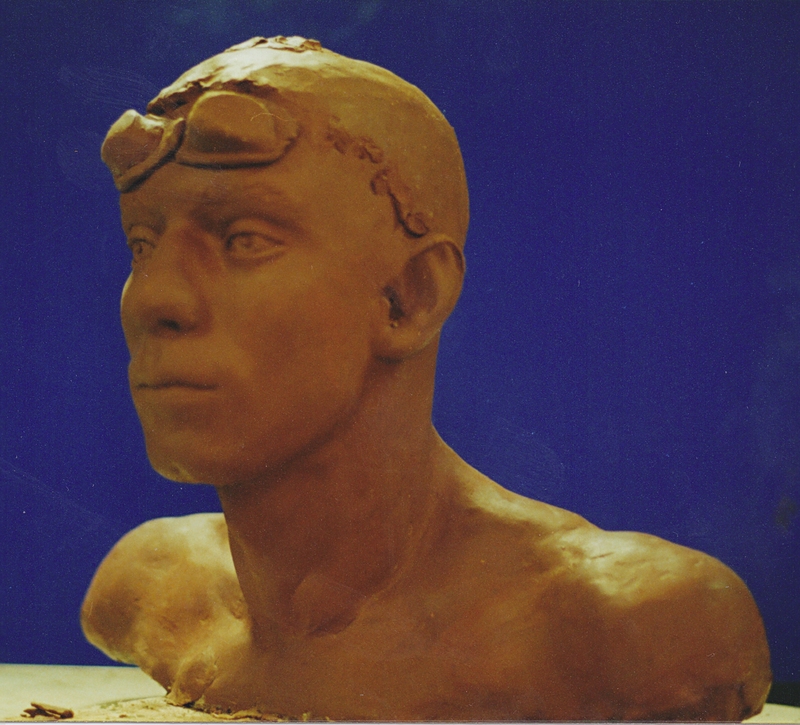 I spent some time doing a life sculpture from a talented swimmer called Marcos de Barros. 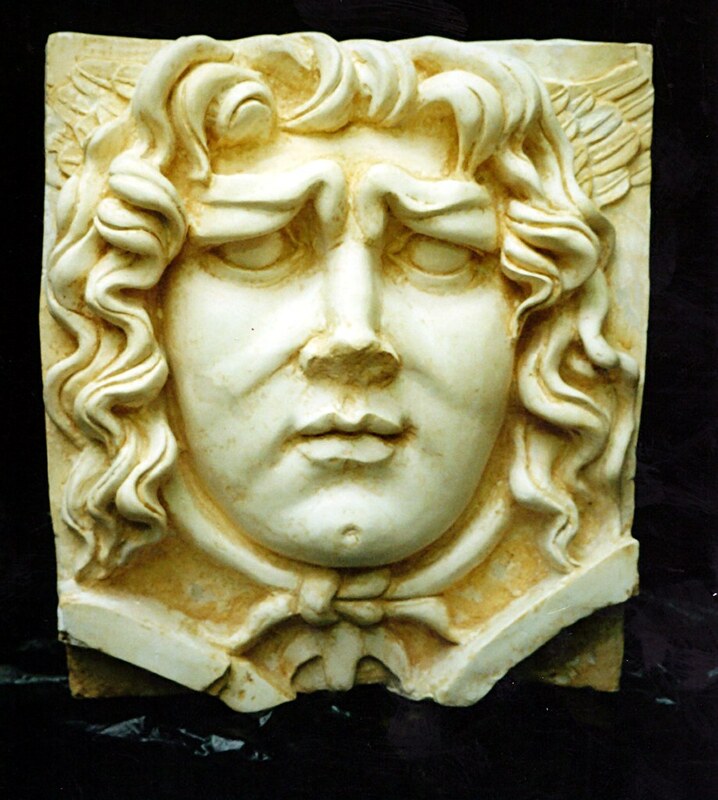 Above is pictured an early phase in terracotta, later developed into a twice-life-size (i.e. 8 times volume) head. Sort of getting in the mood for sculpting a swimmer. The crack is after moulding for a bronze. 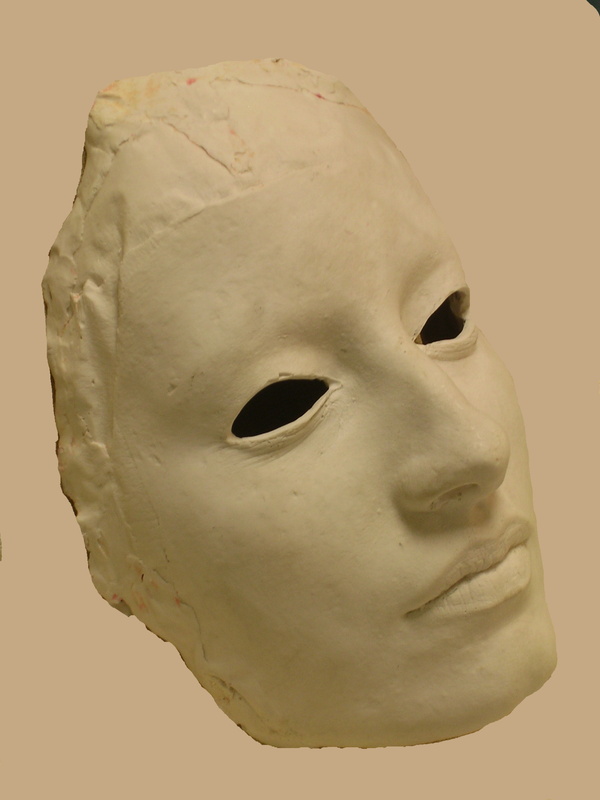 It was moulded when the original terracotta clay was leather hard, a little firm to remove without some damage. 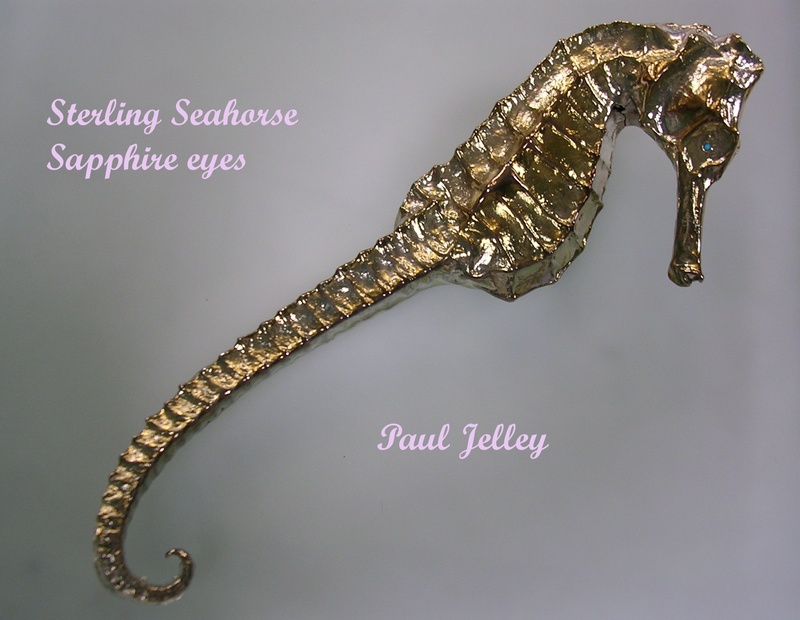 This is a sterling silver seahorse I cast from a dried specimen bought some decades ago from a Cornish village. The eyes are two sapphires set in a sterling silver tube which I rivetted right through the head. 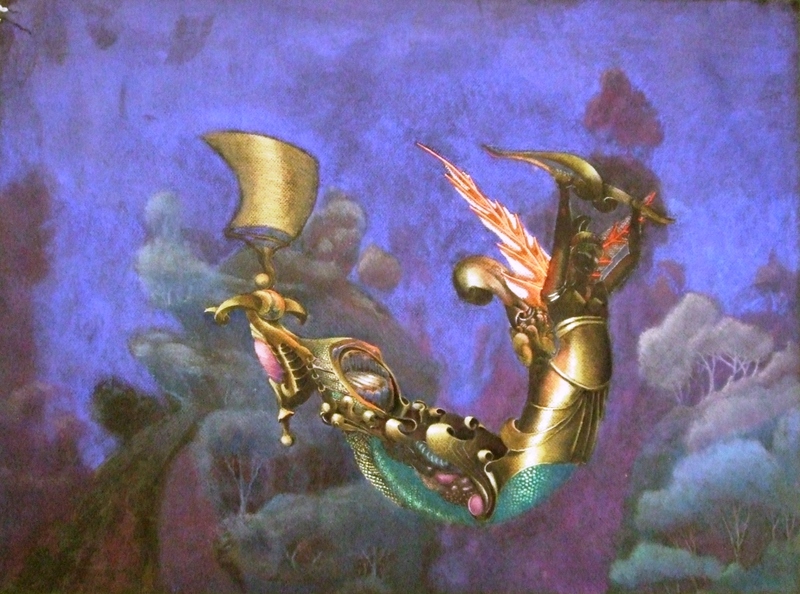 It was later displayed upright on a silver threaded post. 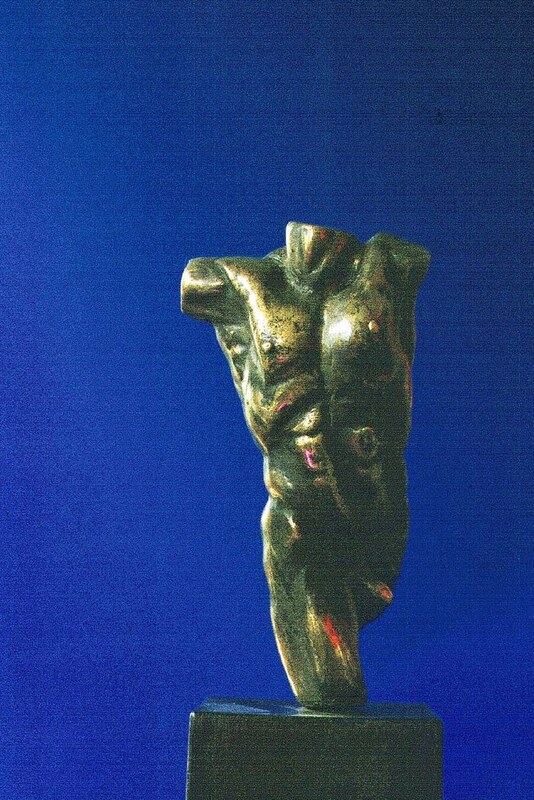 I spent a few years making a variety of resin bronze sculptures, all of which were sold in galleries and art fairs around London. 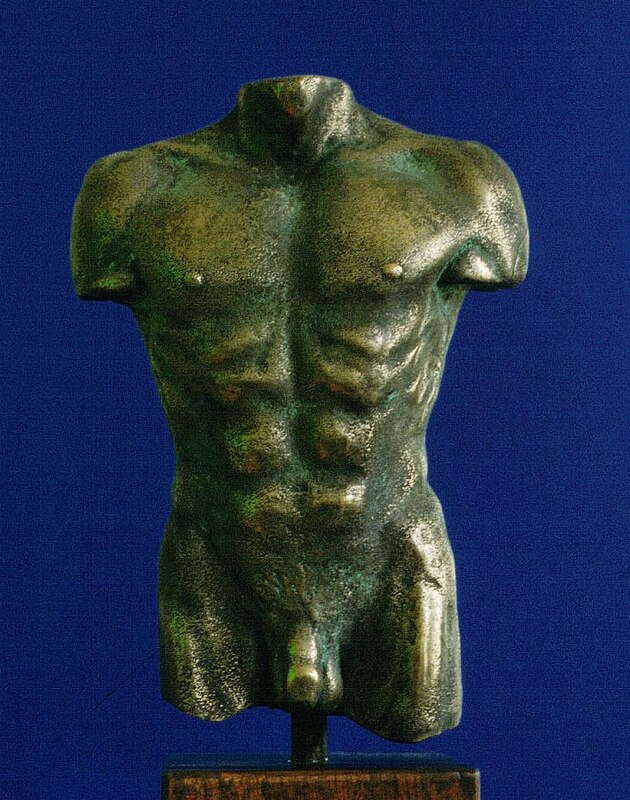 The picture of Eric above (sorry about the rather inept photo-editing) is one of the few male torsos I did in resin iron. Subsequently, after buying the equipment for a small foundry, I continued by casting in bronze or silver instead. I am still looking for a suitable workshop space to enable me to cast iron by a thermite technique - any offers? 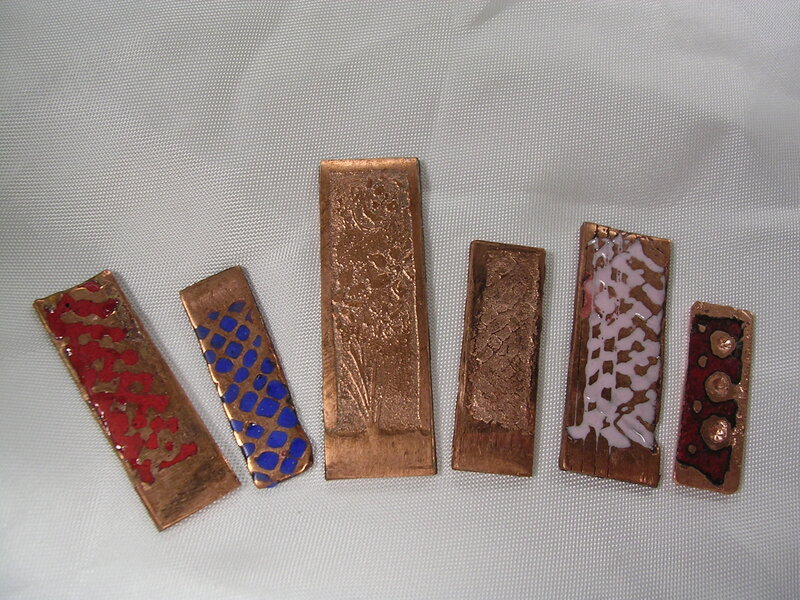 An early experiment, etching ruby glass with 10% hydrofluoric acid. I would like it as my Blog logo, but I don't think my image manipulation skills are quite up to making it look the way I want. 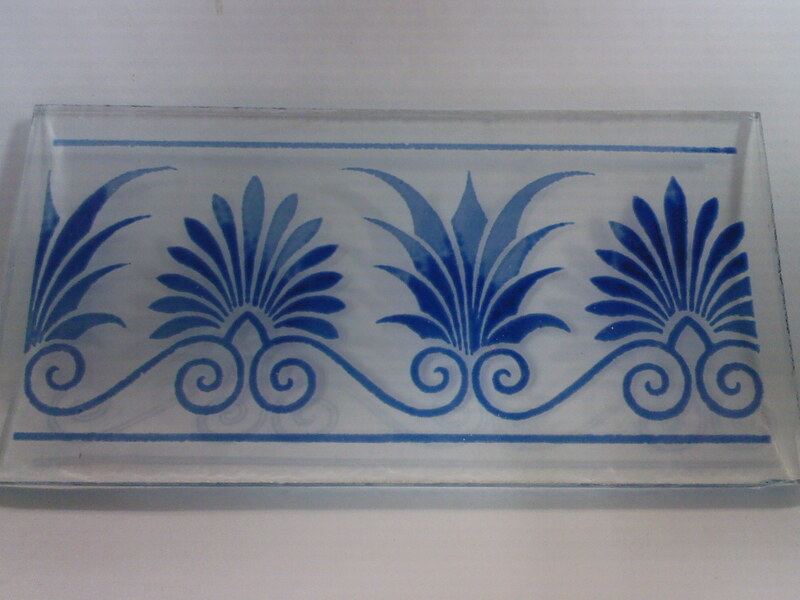 I screen-printed this classic Greek frieze design with blue glass powder onto a sheet of plain glass, then fired the composite in a kiln. 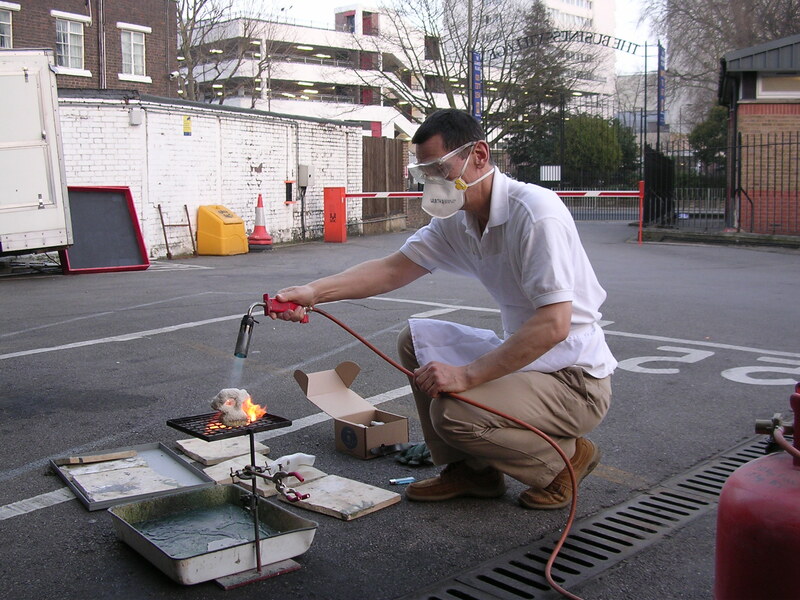 This is me burning out miniature waxes (for jewellery) at the Business Village in Wandsworth, Broomhill Road. I shall greatly miss some of the pleasant times I had over the past twelve years in this Victorian factory, which is due for demolition in the very near future. 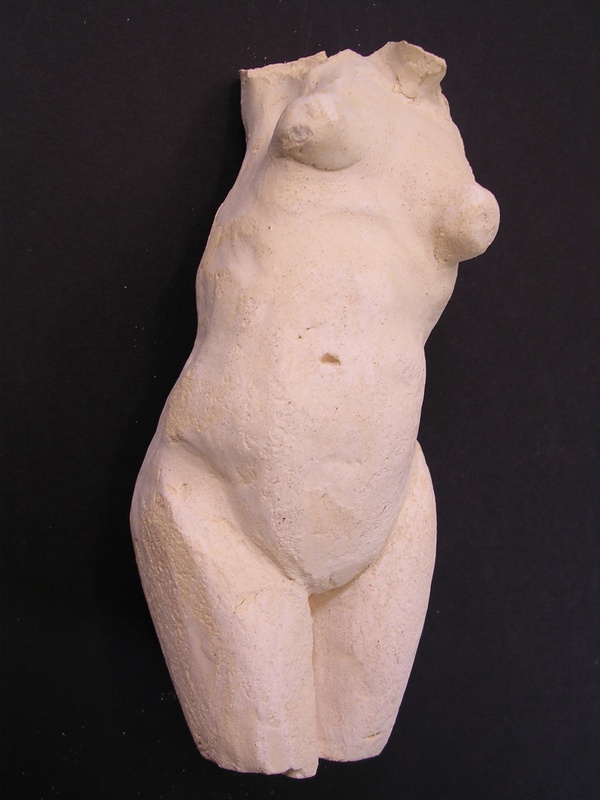 Cast in bronze, about 30cm high. 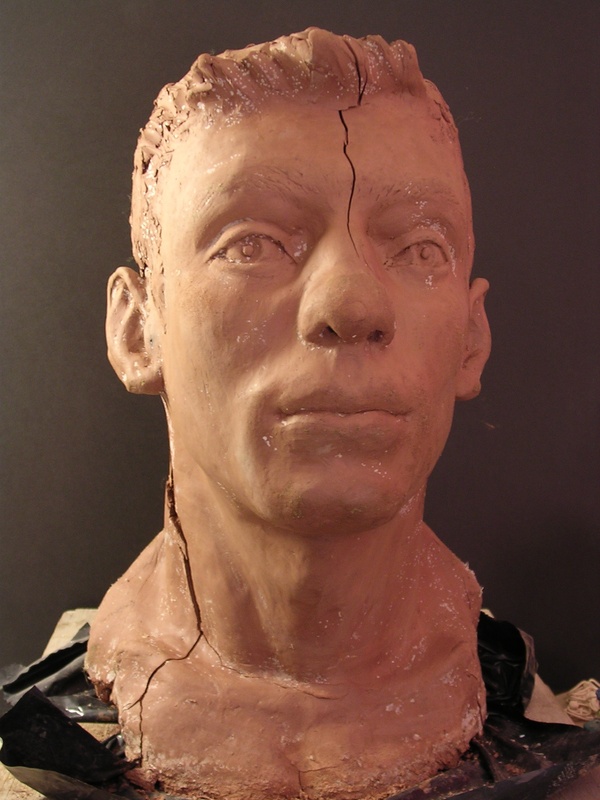 I made the original male torso in plasticine, and glued sand to it before moulding and casting. 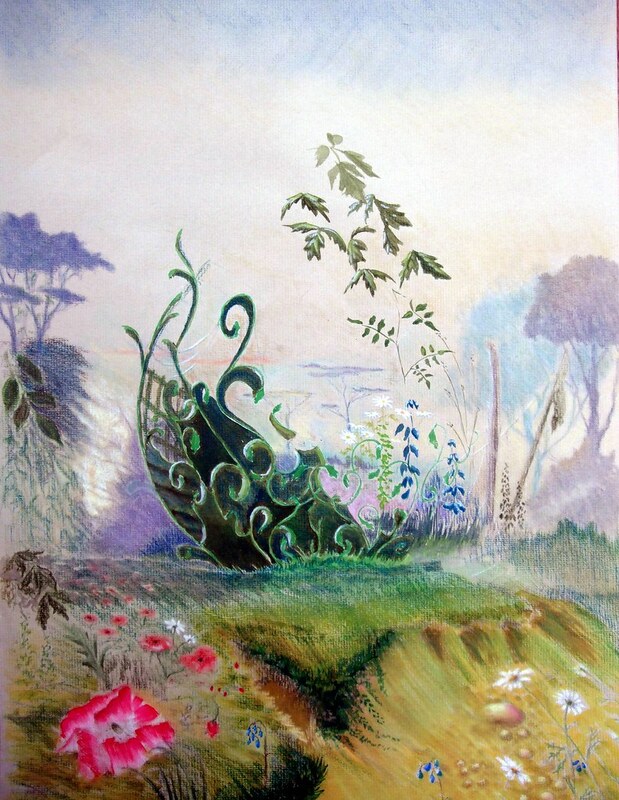 This is one of the three illustrated on a gallery leaflet, elsewhere on this site. 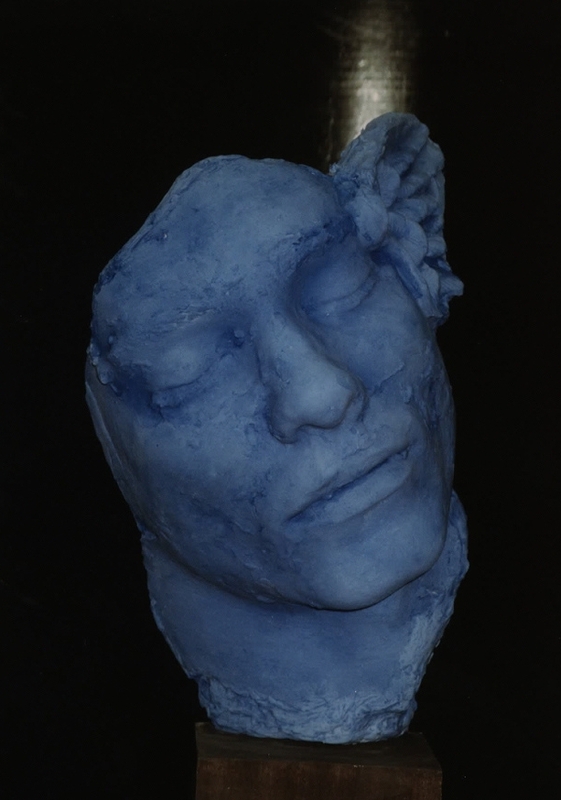 This is a carved version of a very small sculpture I did of a friend called Jane. I also did a plastically-modelled version which was cast in resin iron, and given a graphite finish. This was a young Swiss student, of striking appearance, at the London College of Fashion; she attended my classes with a friend to explore life casting. 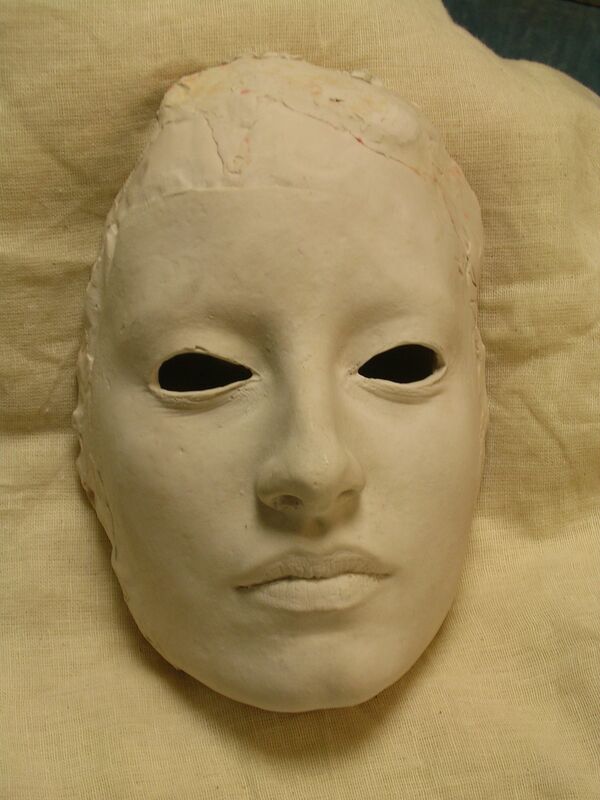 I made the mould with dental alginate and then took a cast in plaster, as illustrated. ... but there's hope yet. 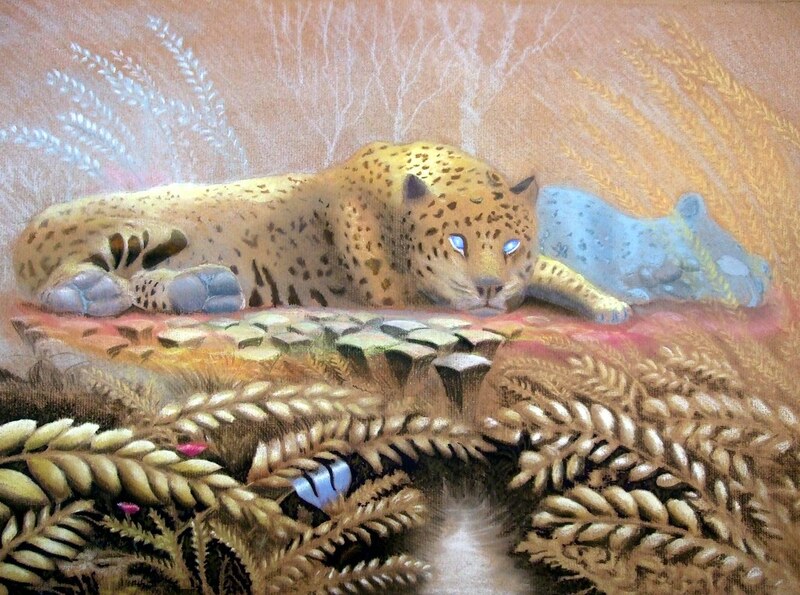 The top two were done with coloured pencil on black paper sometime in 1985, around 3' x 4', later I tinkered with a more golden-tinted version. 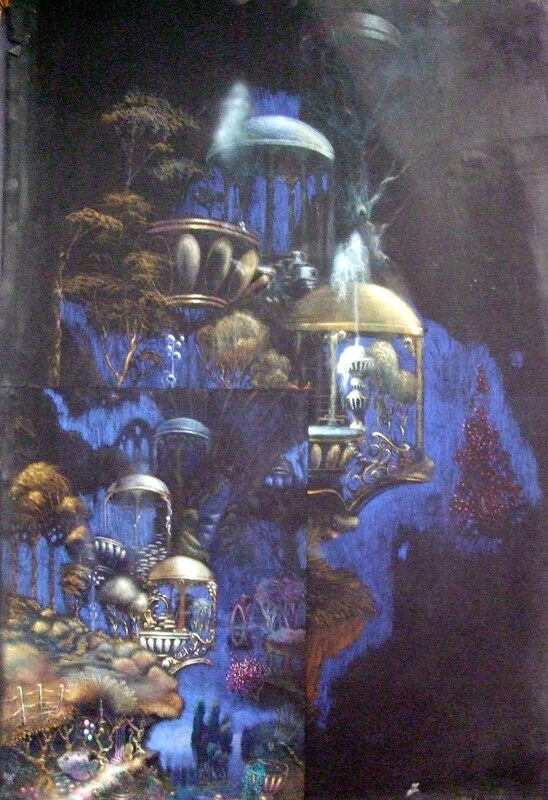 Reminds me of art work for the cover of a "DiscWorld" novel. 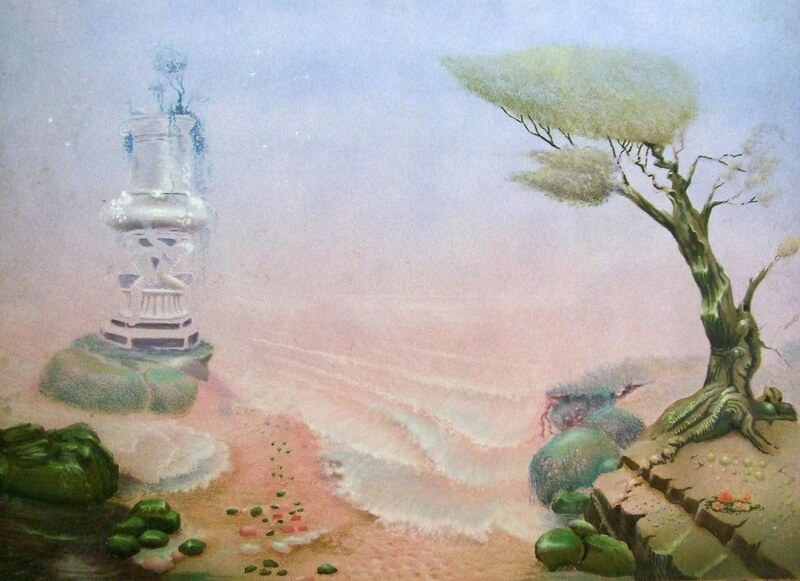 The others are variously unfinished sketches done around 1990 probably. 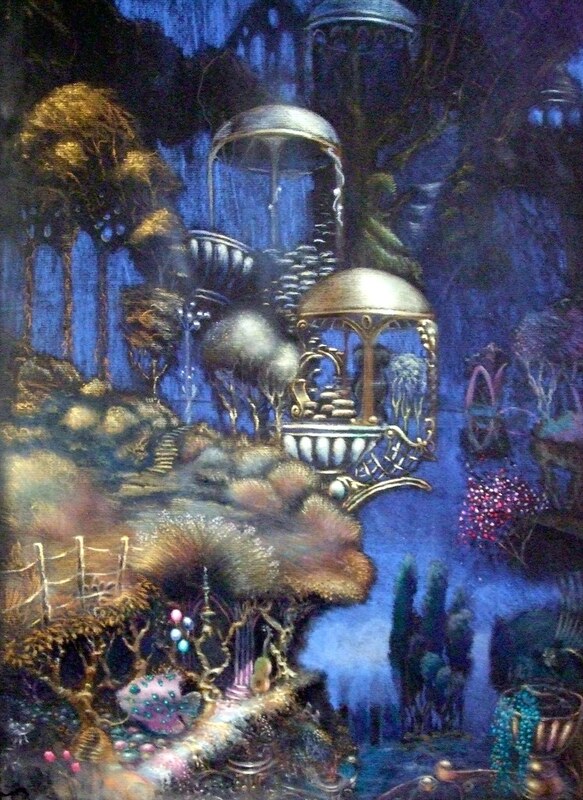 The young lady is Anna Kavanagh who was renting at Studio Place at the same time as myself. All these sketches were found heaped on the floor in a cupboard, and seem to have lost a lot of their pigment. ...well, that's what we did, while waiting for ipods and mobile phones to come along...As mentioned above, much of the colouring pigment seems to have ended up on the floor along with the dust. 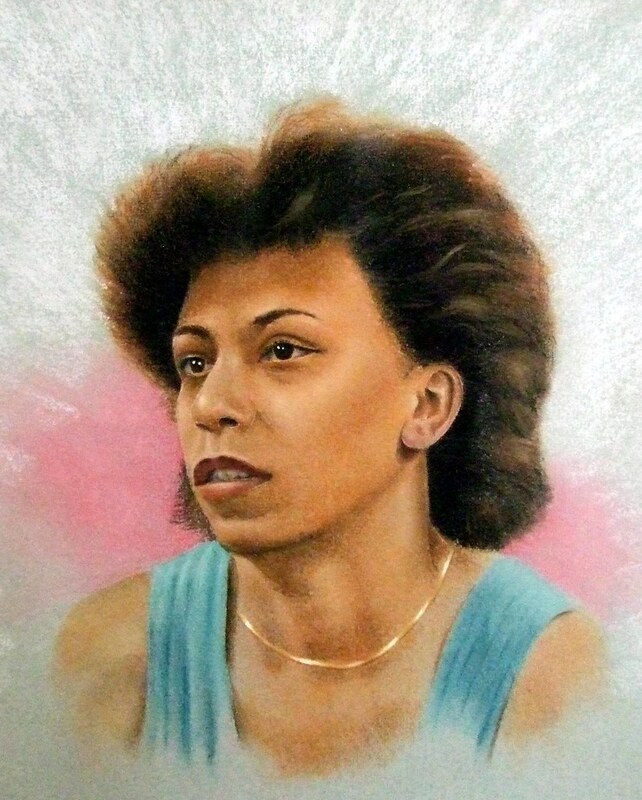 The first picture was actually a second version; I did the first on pastel paper and gifted it to Isabel Langtry, then sculptor in residence at Central YMCA. This second version was re-coloured onto a B&W photocopy, and there wasn't enough 'tooth' on the paper to take the colour. 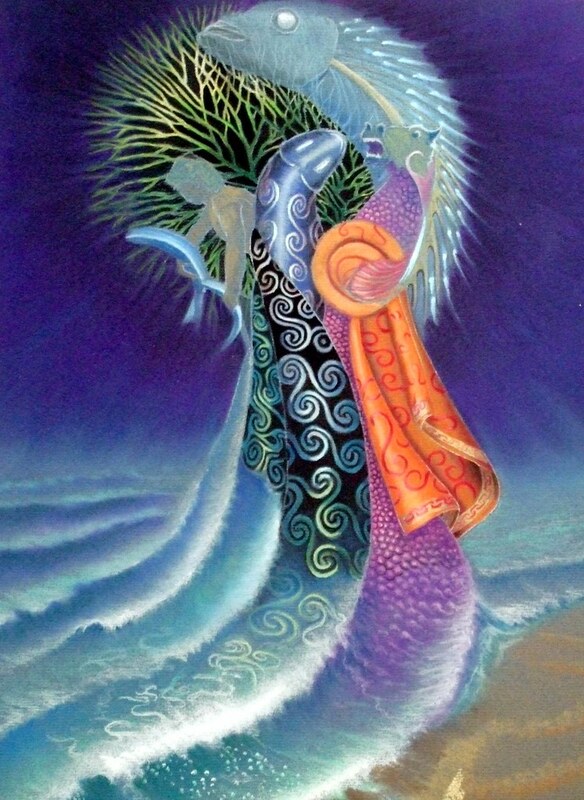 And I remember that the picture with the cluster of figures arising from the waves was used as a sketch for a version re-done on board. 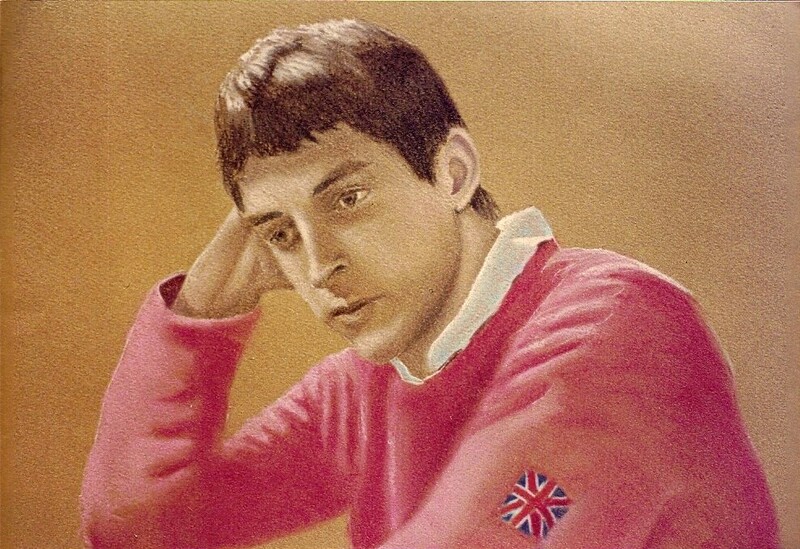 The fifth picture was a composite made from photographs of figures in the Foro Mussolini (now Foro Italico), and the last is a sketch I made of Stephen, my partner since 1983, in the first months we met. The one on the left was hacked out in terracotta-tinted plaster, and used as a candle holder. The plate behind was a present from Barry Woods, an expert potter (although I believe he later abandoned the wheel to work for the BBC). 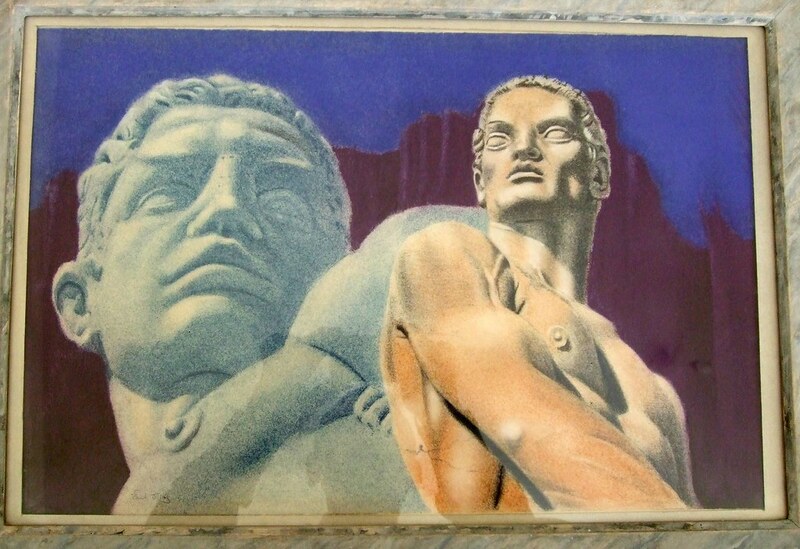 The sculpture on the right, which I variously call 'dancer' and 'sprinter', is one of my best pieces but I only have a scanned picture. I took a 5-session stone setting course at Central St Martins in February 2005, financed by Central YMCA as part of my Staff Development. It ran in the evenings and was spread over five weeks. 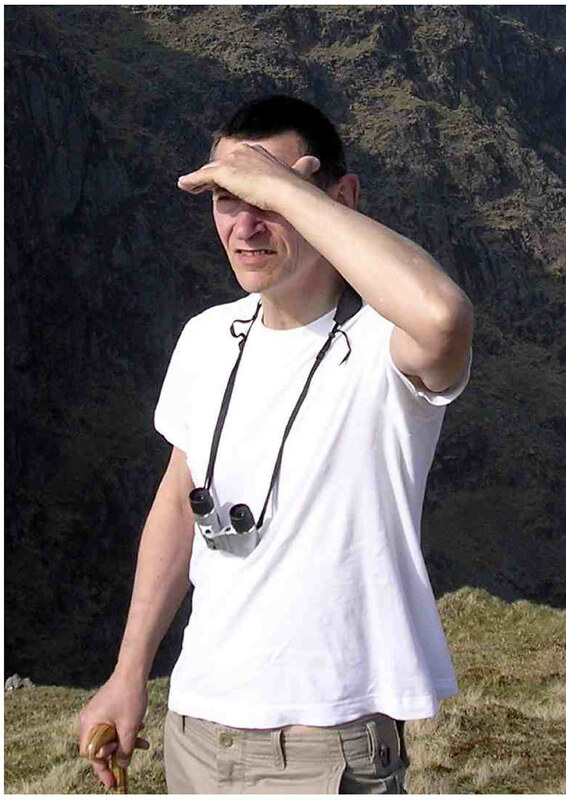 The tutor, Martin Hopton, was well experienced both at stone setting and also at expediting the learning process for all students. I think there were only two other males on the course, the remaining 5 or so were female and mostly in their twenties and thirties. The jewellery workshops at St Martins, although somewhat old-fashioned looking, were very well equipped, and especially good on traditional equipment. 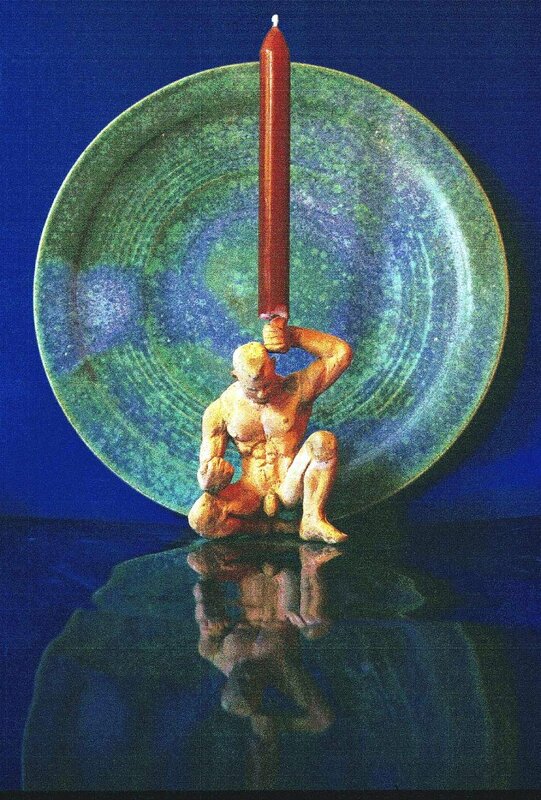 I took a glass fabrication course with Julian Ewart and Helen Maurer as tutors at Central St Martins on 6th August 2001, financed as part of my staff development by Central YMCA. The course featured both slumping, fusing and etching of glass and resulted in a large number of pieces which I took away with me. These included the red-glass etched 'Jelf' logo and the screen-printed and embedded Greek Key design shown further up this column. I also did several versions of a seahorse pressed into powdered plaster, the resulting bed used as a slump mould for glass of varying colours and types. 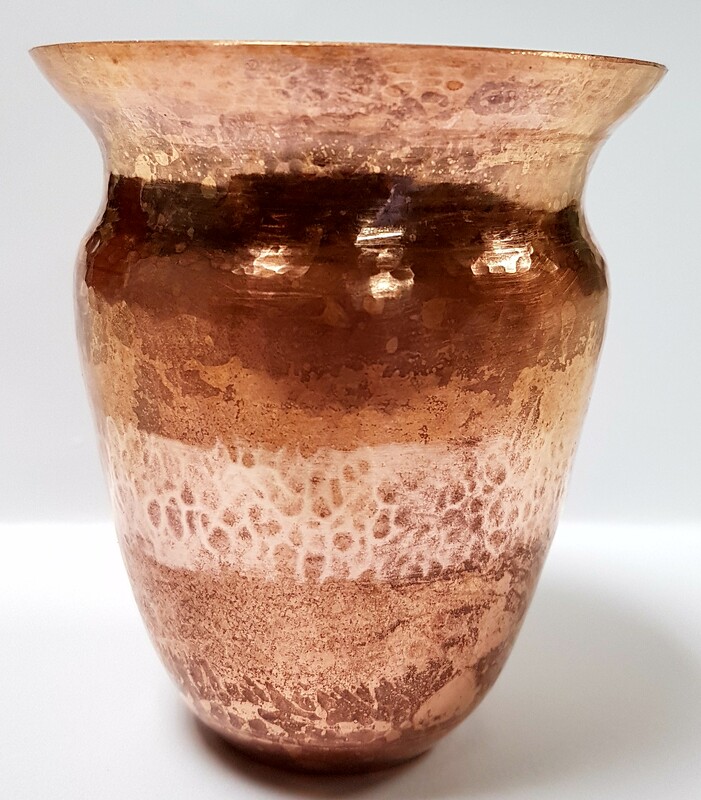 On 14th August 2000 I took a glass casting course at Central St Martins run by Aron McCartney, who was at that time still working on his PhD thesis concerning ceramic shell casting of glass. The course was financed as part of my staff development by Central YMCA. 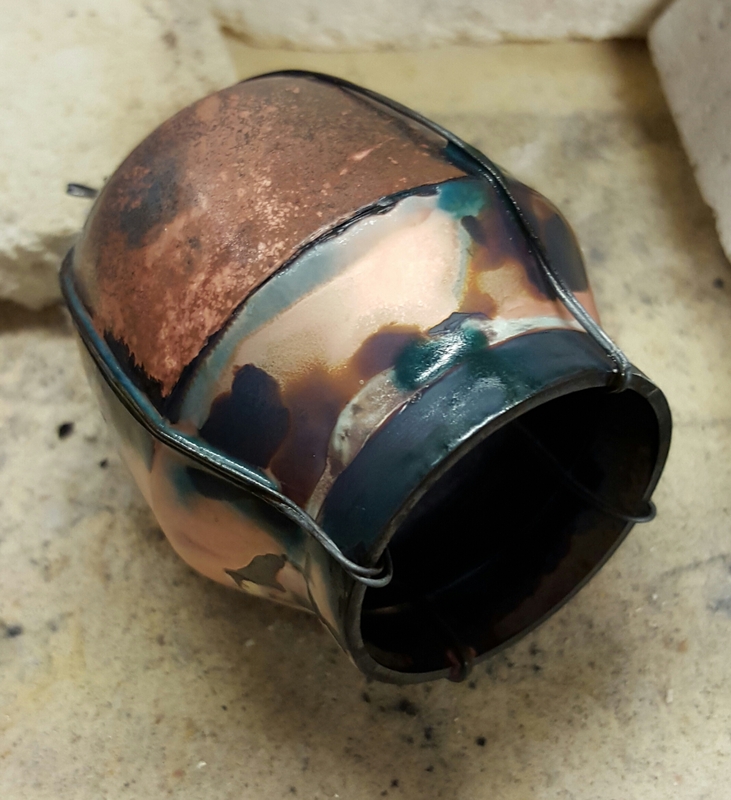 The course was somewhat of a disappointment for me for the first couple of days since it was organised around first making a ceramic shell bronze, something I was well familiar with. 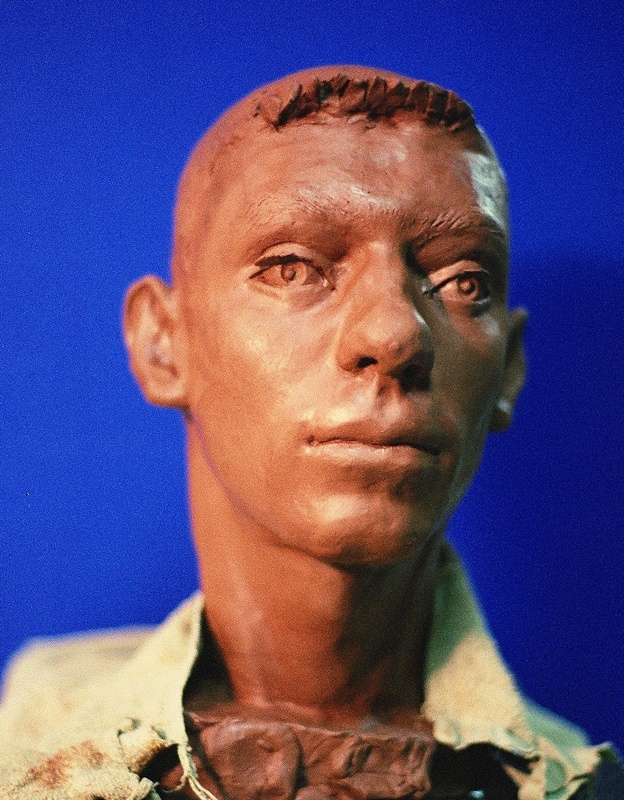 The subsequent casting of glass into a lost-wax mould lined with plaster was more interesting, I still have both the bronze and the glass casts. I remember picking out bits of castable lead-crystal glass from a large coffer until I acquired enough bits to cast. Please do not construe any of the information on this web site as an indication that you may necessarily safely copy any of the processes or procedures therein! Your welfare is your own concern, and if you wish to repeat any of the processes mentioned then you are strongly advised to find accurate, relevant and appropriate Health & Safety information from suitable sources.